The wonderful part about reading wordless picture books is that it forces the reader to slow down and thoughtfully engage with the illustrations. 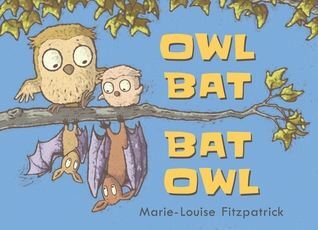 Owl Bat, Bat Owl by Marie-Louise Fitzpatrick is a great example of a wordless picture book that begs to be read slowly to savor its quiet, yet powerful message. We might be different, but we can all get along is something we all need to remember more. Good choice for K-2 readers. Especially good choice for teaching inference. I was given a review copy by Candlewick Press to read and offer an unbiased review. 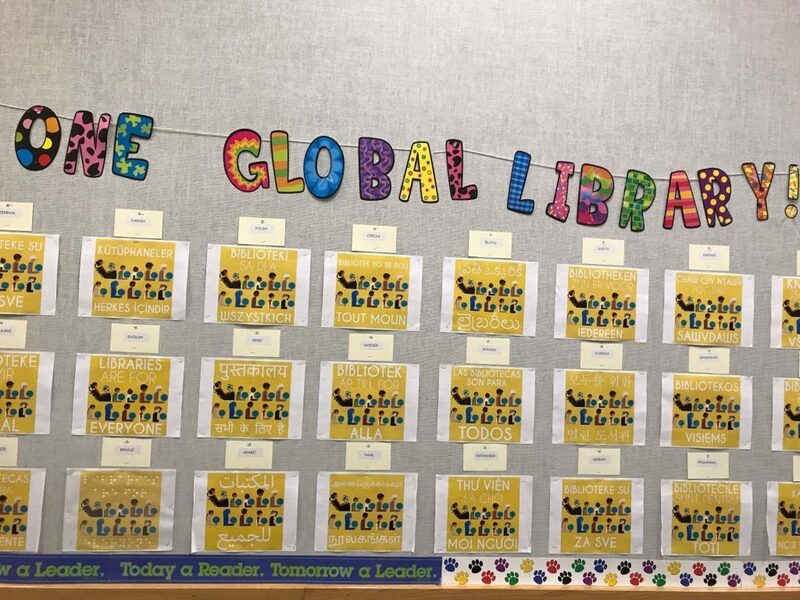 I’m not usually one to do a theme, but I’m giving it a try this year with a global theme: One Global Library. One of the qualities I love the most about my school is the rich diversity of our families. Besides English, there are 84 different languages spoken by our families. 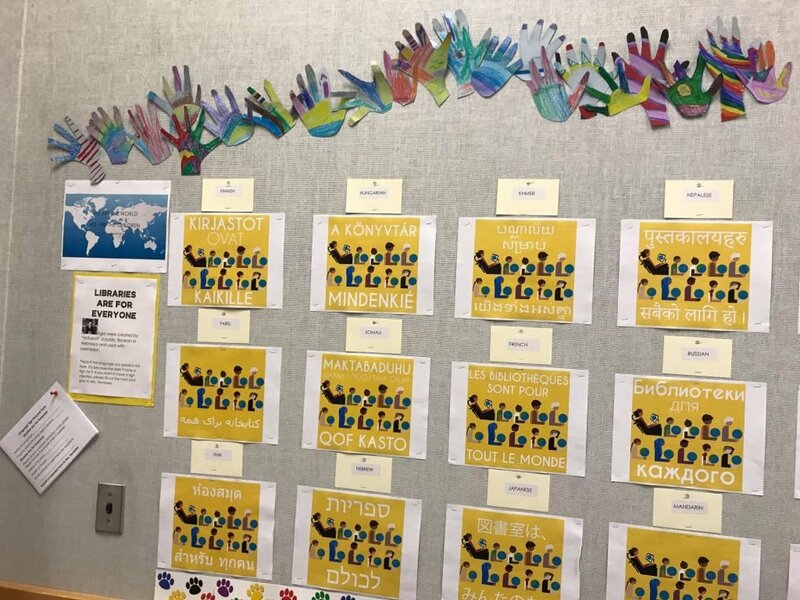 To celebrate this diversity, I have created a wall outside the library with signs saying Libraries are for Everyone in 51 different languages. 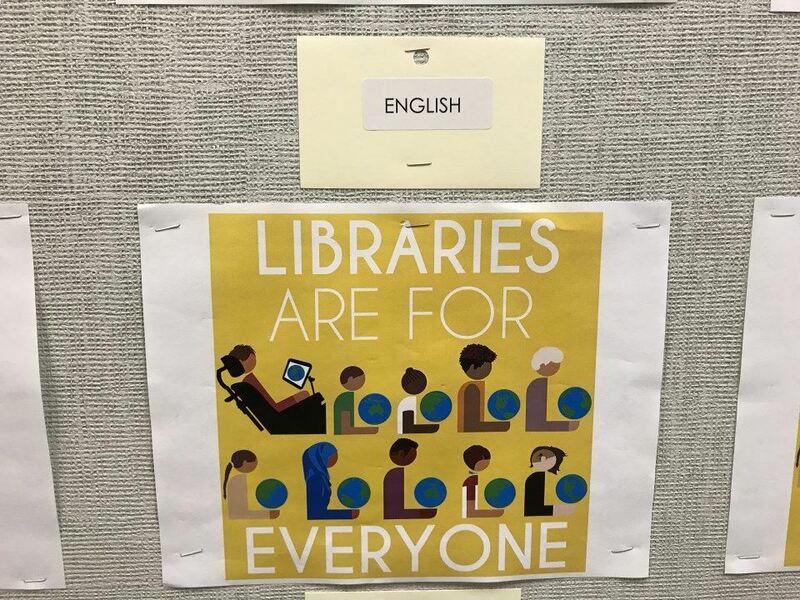 These signs were made by Rebecca McCorkindale, a public librarian in Nebraska. They are published on her website Hafuboti. She wants and encourages libraries to download, share, modify and enjoy her signs. 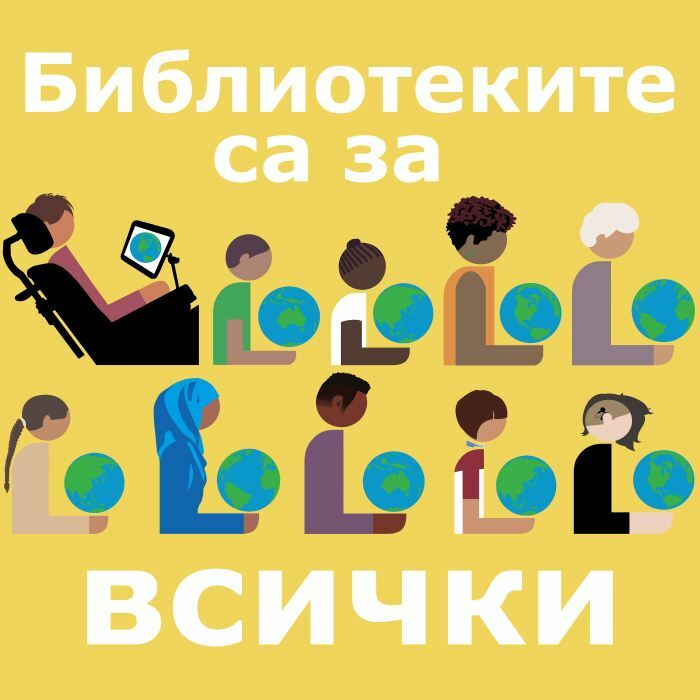 Libraries are for Everyone in Bulgarian. I have enjoyed watching students walk down the hallway and point out the language they speak to their peers. 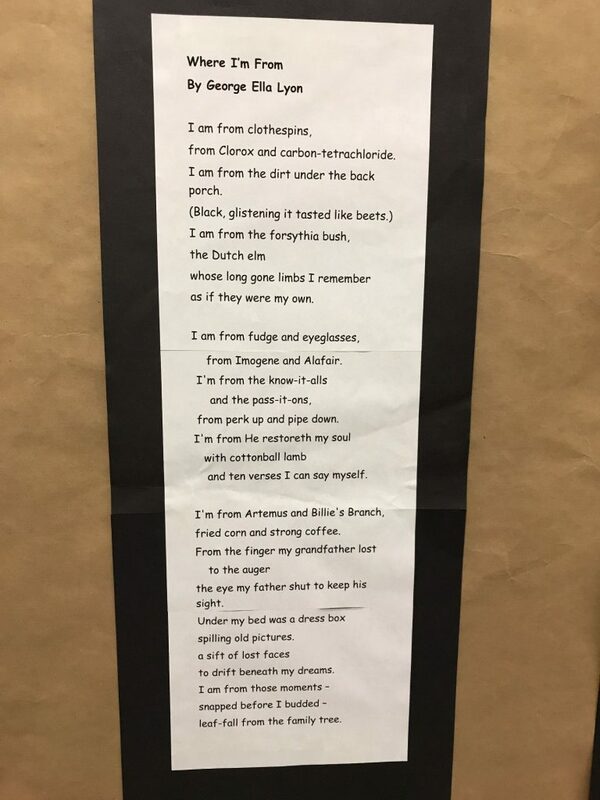 I believe having their language celebrated is just one more way for our English Language Learners to feel included at our school. When our ELL teacher saw the display I thought she would never stop smiling. She now has her country display next to ours so we can have a united message of unity and acceptance. 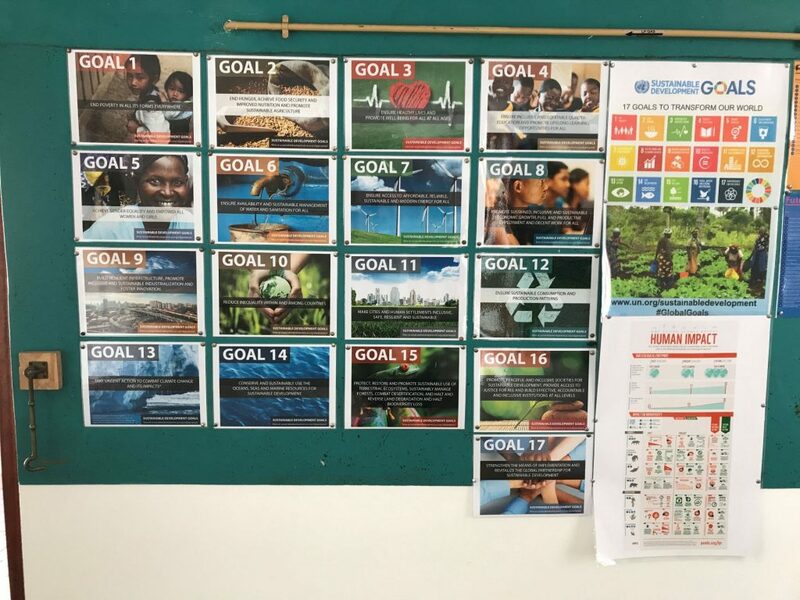 This theme will tie into my focus on global citizenship as well as learning about the Global Goals, also known as the Sustainable Development Goals (SDGs) and how they pertain to literacy. When I think about teachers who give their hearts to teaching, these ladies are at the front of the line. 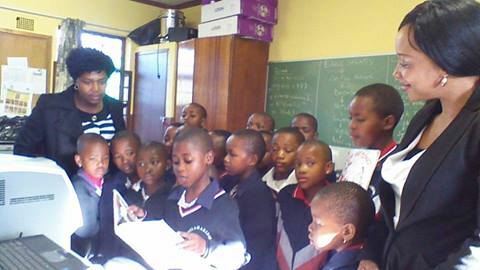 Tinny (left) and Vernice (right) teach at Pula Madibogo Primary School in Limpopo Province. Tinny and Vernice began the Reading Club there and we have been connecting ever since. 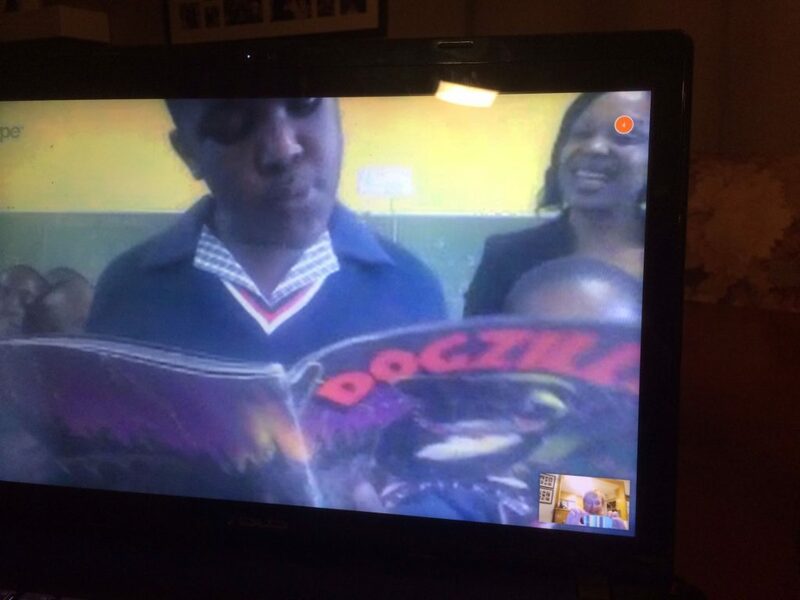 We send their students books and then we Skype and their students talk about their reading. These are some photos of our calls through the years. After I visited their school in 2015, I knew I would have to come again. Unfortunately with my schedule on this trip, I was only able to come for a few hours. 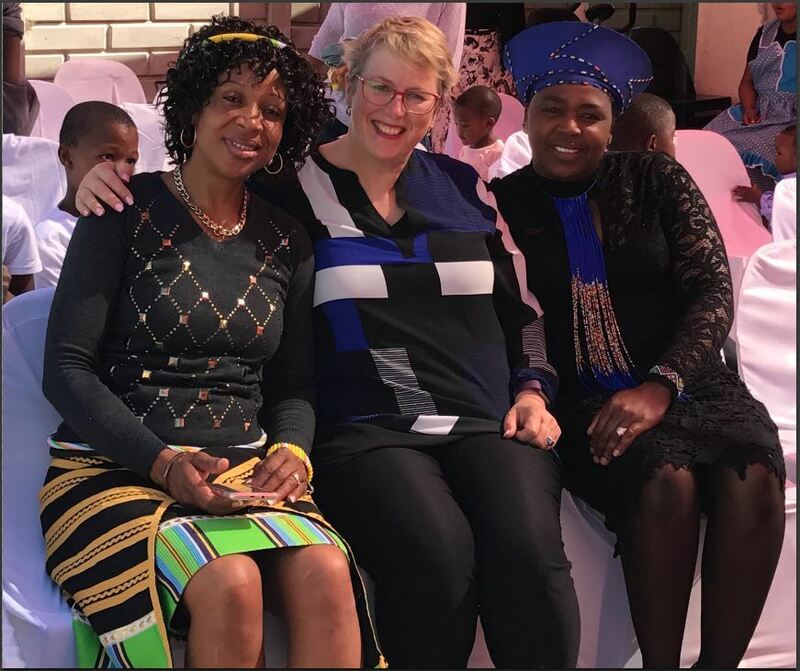 We did see each other at Phuti’s Community Reading Club Project launch party so we were able to re-connect before I got up to their school. Tinny teaches 6th grade and believes with her heart and soul in the saying Readers are Leaders. She also knows how to make a person feel special. When I arrived on campus, I saw some drum majorettes practicing in front of the school. I thought they were practicing for a competition. No, they weren’t. 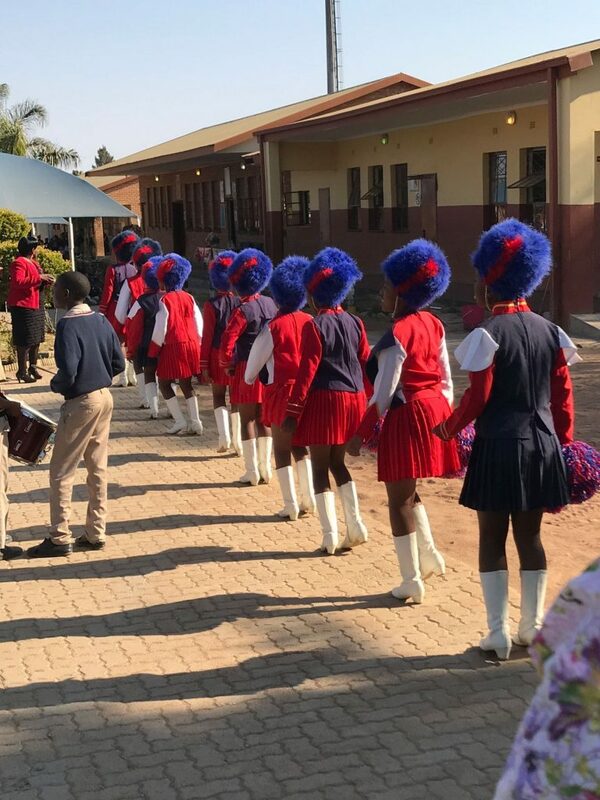 The Drum Majorettes greeted me and led me into the school where the student body was waiting for a special ceremony. The students were in charge complete with a ceremony leader and a schedule of events. From beginning to end, I was touched and overwhelmed with emotion. 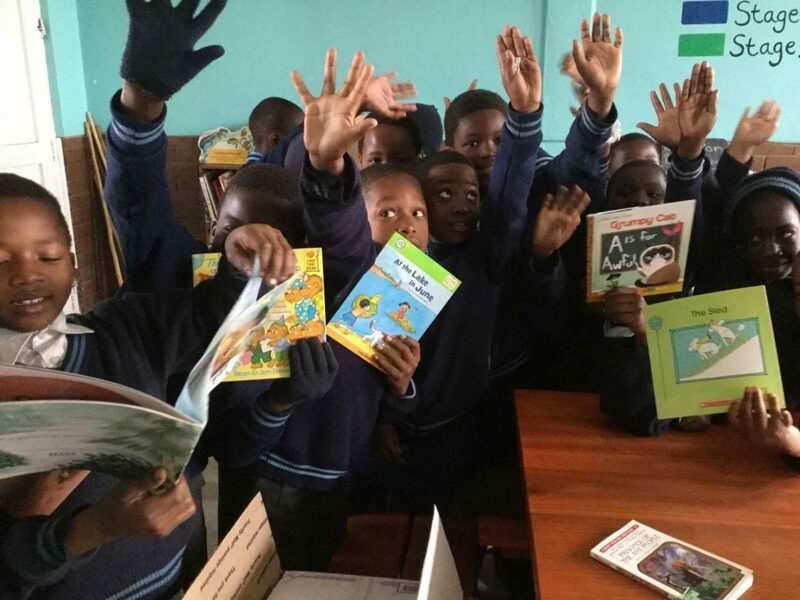 My students and I send this school books, but the kids at Pula Madibogo are the superstars because they are using the books to improve their reading. Yet they were treating me like I was the superstar as they shared their gratitude. All morning long, the students impressed me with their passion for reading and school. I have been able to live a life where education was something I expected and I have at various times taken it for granted. By many standards, I have lived a life of privilege. 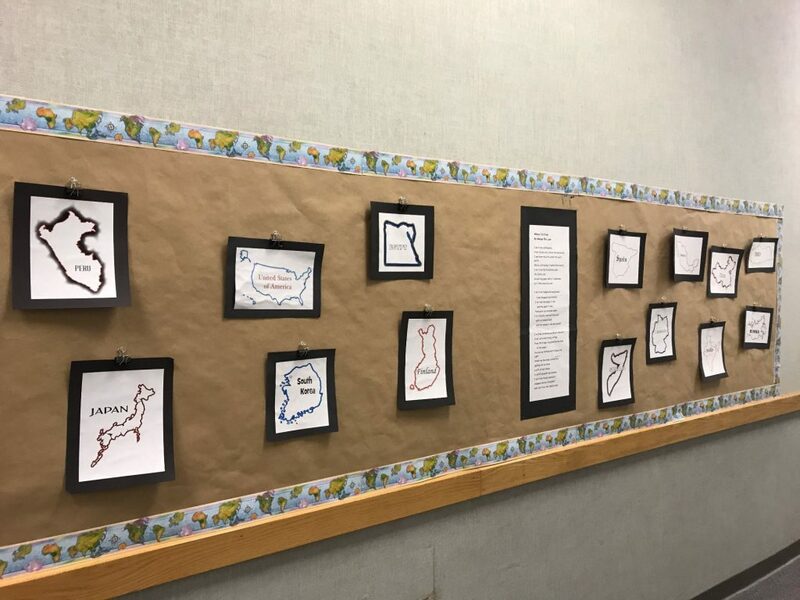 From my small town in rural Massachusetts to California, Oregon and Washington, I have been able to live and teach in areas with quality public school districts. 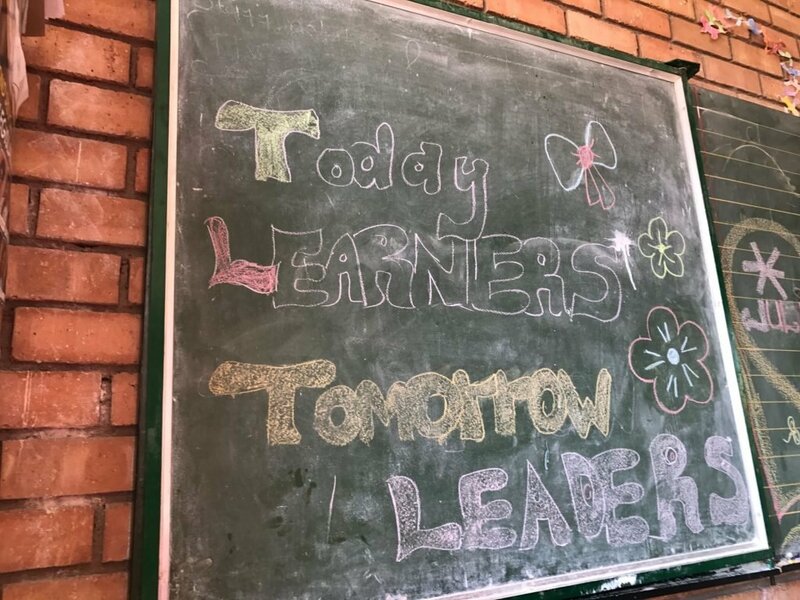 The ability to have access to a quality education is not always possible and certainly not in rural Limpopo Province. 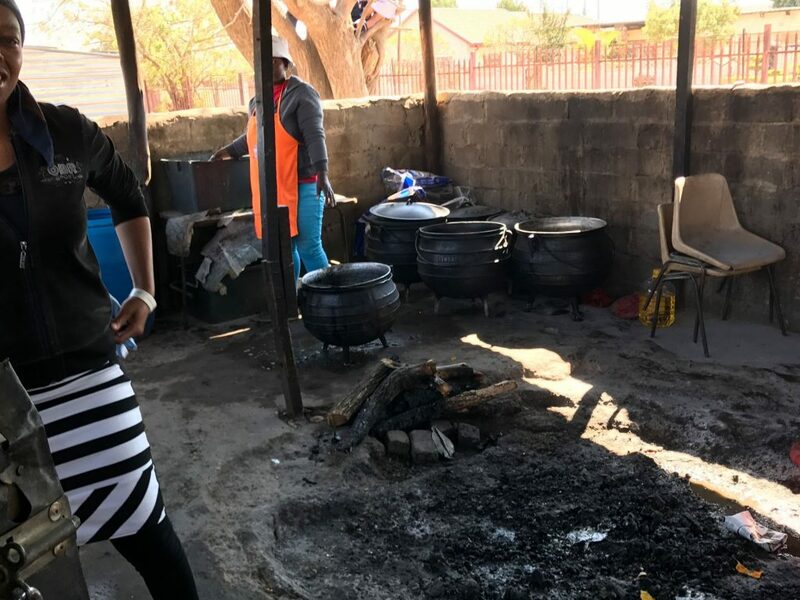 Yet at this school where the women still cook in an outside cook shelter using traditional cooking pots, the teachers are determined to make things different for this next generation of learners. 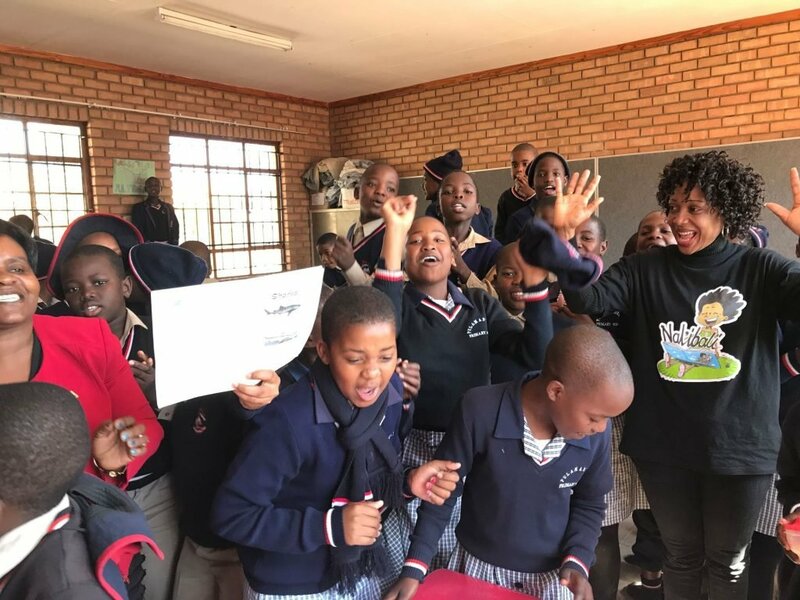 Women like Tinny and Vernice, as well as the other teachers at Pula Madibogo do everything in their power to bring the best out in their students. I felt honored to spend time with them and share teaching ideas. I loved hearing the students read passages from books, sing songs, or tell fun stories. They have passion for learning. 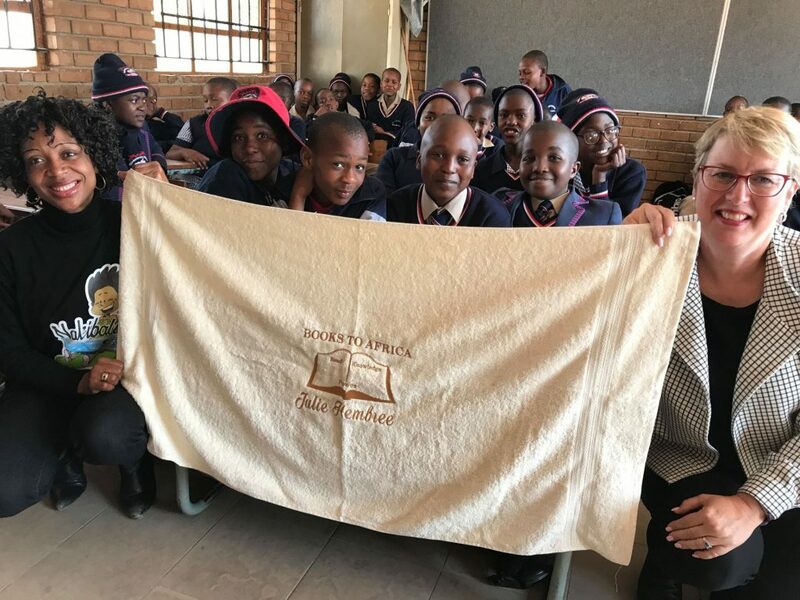 In the classroom Tinny’s students continued the presentation with story-telling, posters, a lovely embroidered towel and a heart-felt plea for more books. Honestly as I looked at the books they were holding, I realized they had worn them out from reading love! They even had a book that I had sent at least three years ago. As I walked around campus after the presentation, students came up to say hello. One girl I recognized immediately from when I was at her school in 2015. I had a selfie with her then, and we did it again! Another boy, Nathaniel and I had a longer conversation. He is now in 7th grade, which is a critical grade in South Africa. Very often children do not have the opportunity to move on to secondary school. He remembered my previous visit and really wanted to assure me that he is taking his studies seriously. I shared my card with Nathaniel and sincerely hope he stays in contact with me. He has the drive to go far in life. I just hope his dreams don’t fade with age and the hardships of life. I will be boxing up some books this month and sending them so they have some new choices before the end of their school year. I can’t forget these teachers and students and their needs for materials. The thing is, we can’t do it alone. This is the last post in the series and I hope that other teachers and students will consider joining our program or starting their own. Anyone who is interested can contact me through the Books to Africa Partnership website. Books can change lives. I’ve seen it come true and so can you. Sometimes the words, “thank you” don’t seem to emphasize the depth of thanks I feel for the actions of others who have helped me. 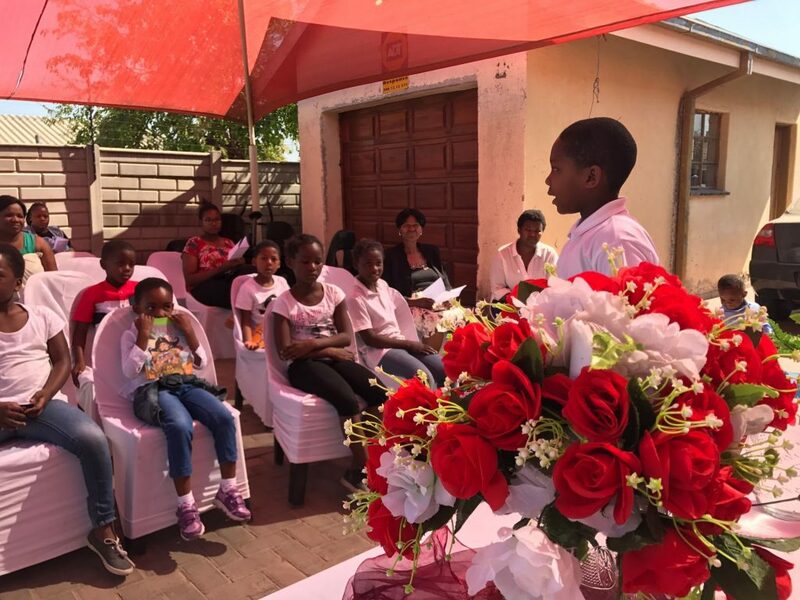 The generosity of Phuti and her husband is a perfect example. 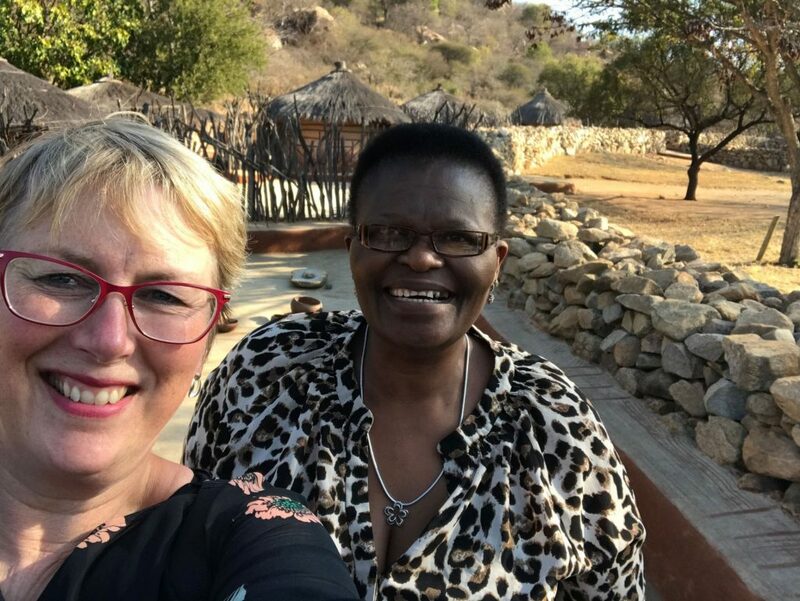 For the past three years, Phuti has been a central force in my Books to Africa Partnership. 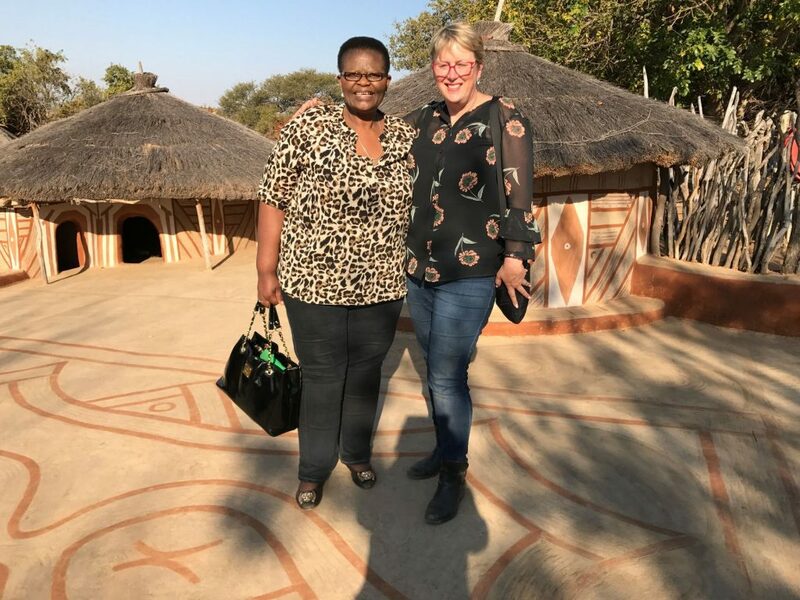 We met in Barcelona, Spain at the Microsoft Global Forum and struck up a friendship based on a mutual belief that all children deserve the best. 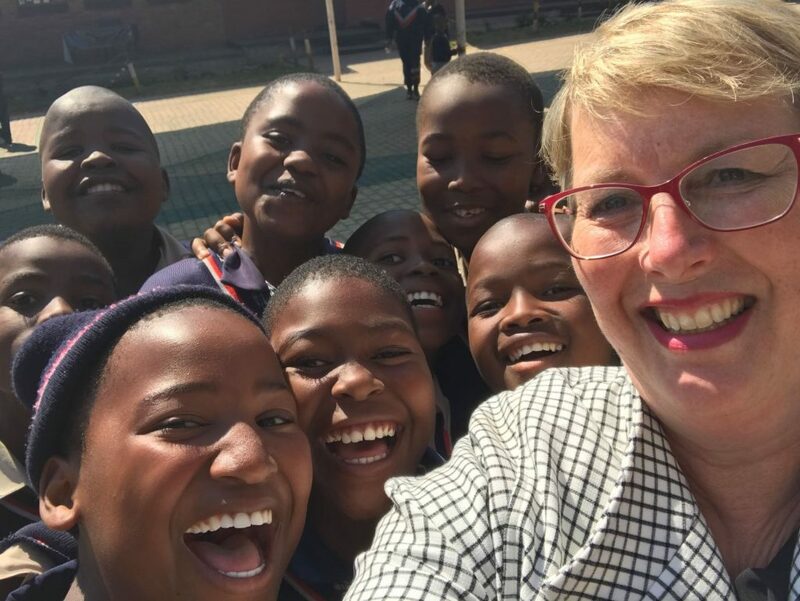 When I went to South Africa in 2015, for a week, I visited her school, Pula Madibogo Primary School near Polokwane, in the northern Limpopo Province. 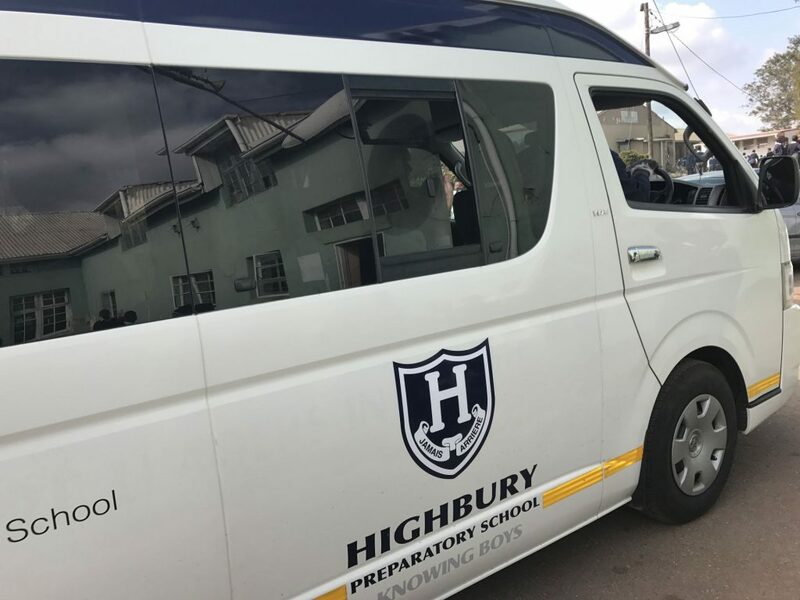 Phuti was the principal there and would pick me up each morning and bring me to school where I helped teach lessons or worked with kids on their reading skills. We had been sending her books for over a year and I could see the benefit of our actions. Kids came to her office to check out books and take them home. 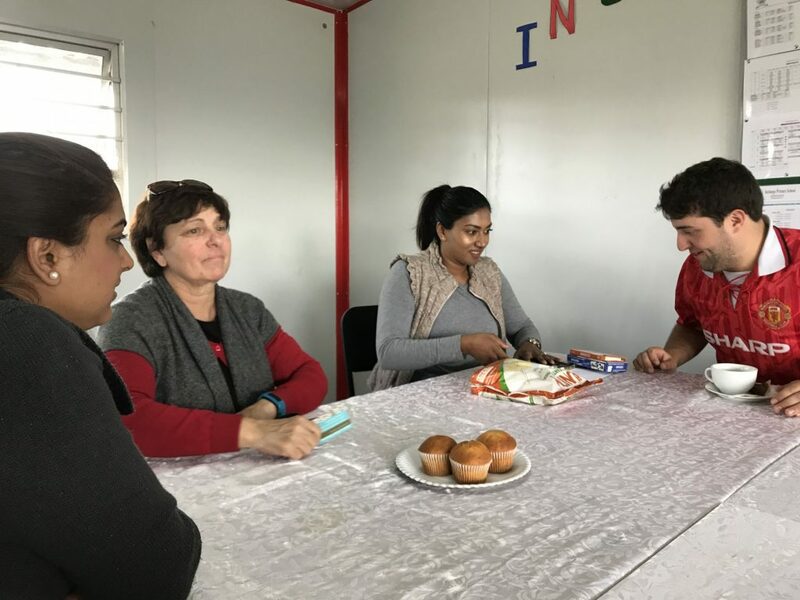 Fellow teachers had started a Reading Club and the school was on its way toward emphasizing the importance of reading in children’s daily lives. Fast forward two years and I visited Phuti again, but this time a few things changed. First, she and her husband were gracious and allowed me to stay in their home while I visited her. 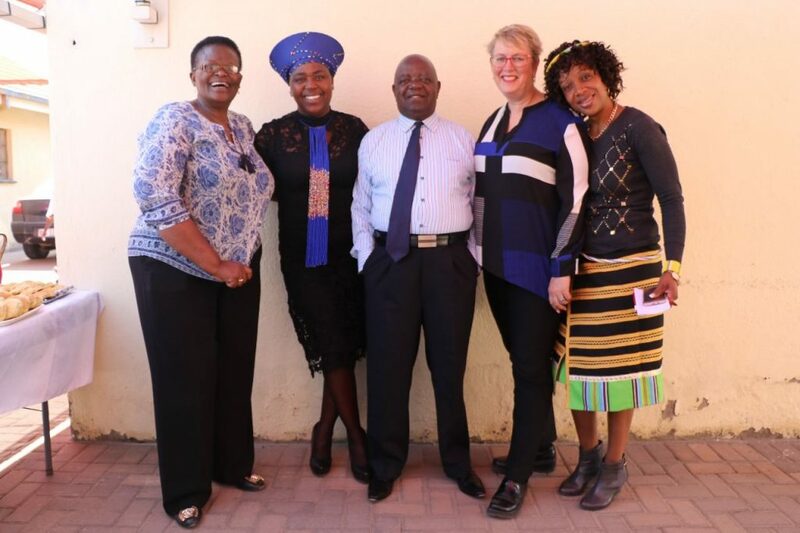 Phuti is also now retired from her principal post, but remains steadfast in her commitment to literacy education. A few weeks ago, she sent letters to neighbors about the Saturday literacy and tech program she was starting. It would be a free weekly two hour commitment for the children. Within days she had more positive replies than she could accept! 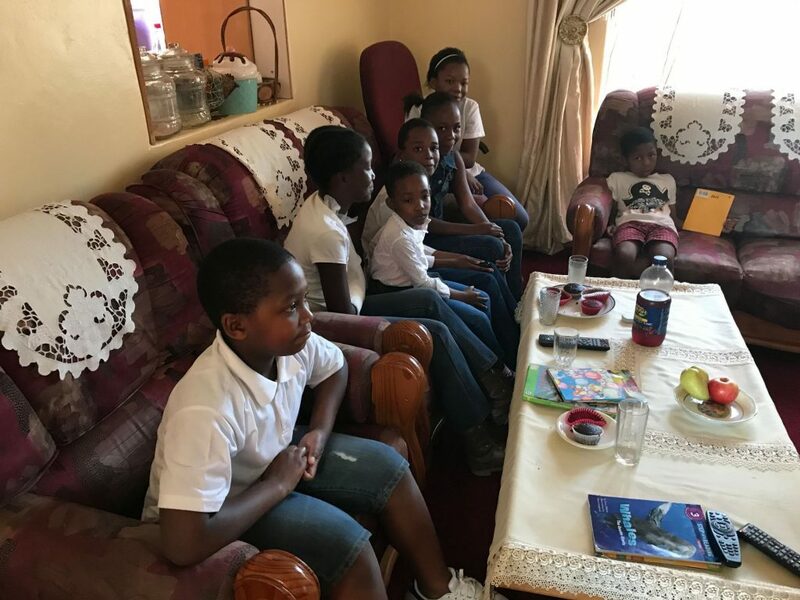 Children started coming to her home each Saturday morning to have reading lessons and learn how technology could be used as an educational tool. 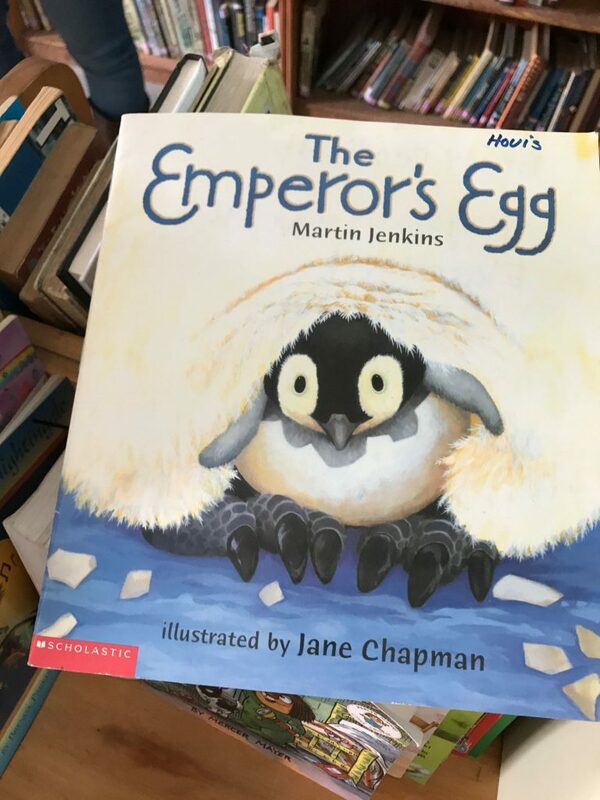 The community reading club was born! 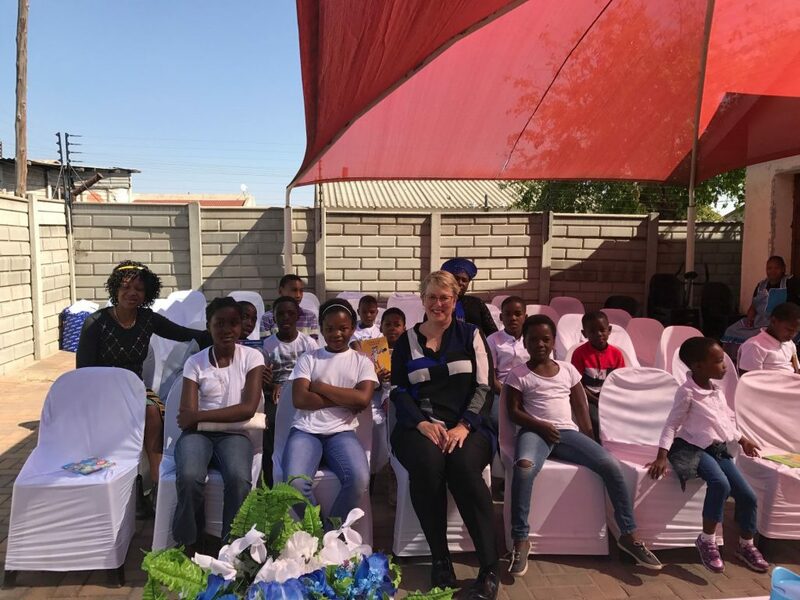 I was fortunate when I came to Phuti’s home because I was able to participate in the grand opening of this community reading project. 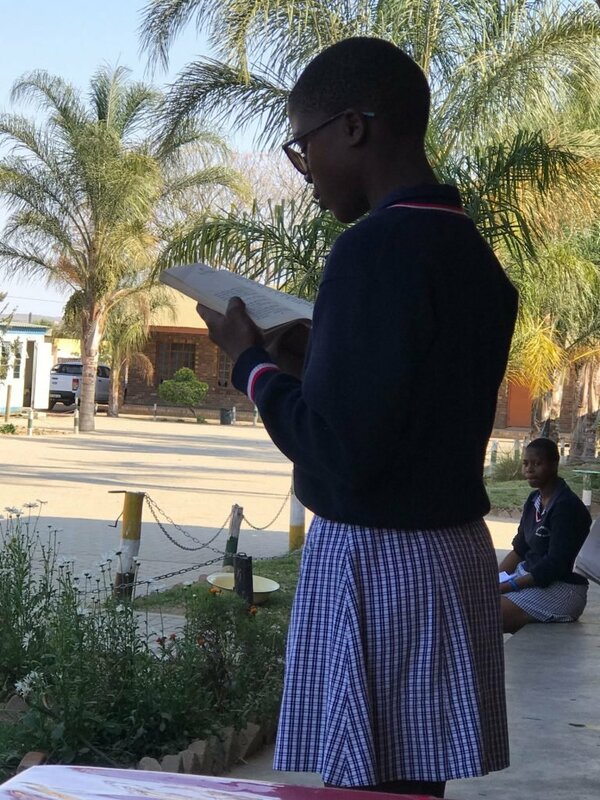 With books we have been sending her this year and others she gathered, the students have been reading and extending their learning on Saturdays. 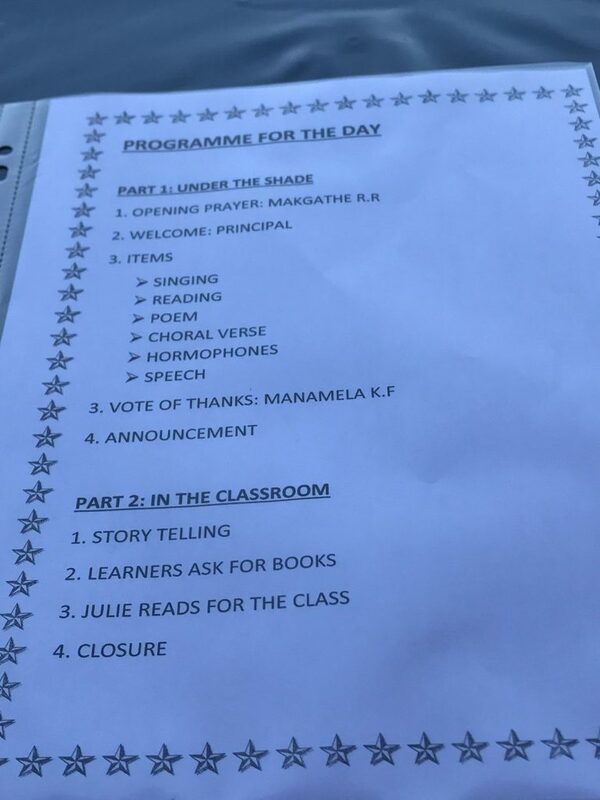 For the grand opening, she had the students prepare the agenda, make a plan for the activities, invite local parents and participate in the events. It was a wonderful morning of celebrating literacy with oral reading, poems, songs, speeches and delicious food! We had conversations about reading and books and the importance of education. 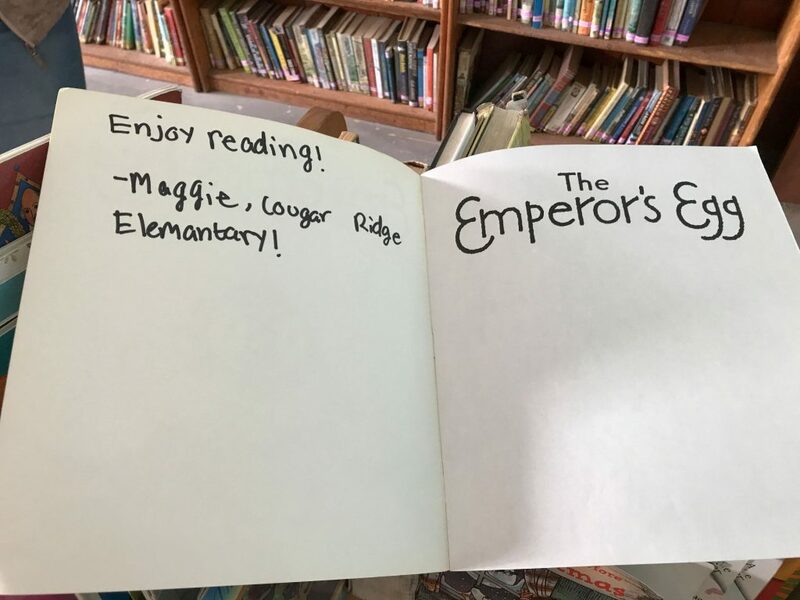 I loved seeing books that my students had signed in the hands of a new set of readers. 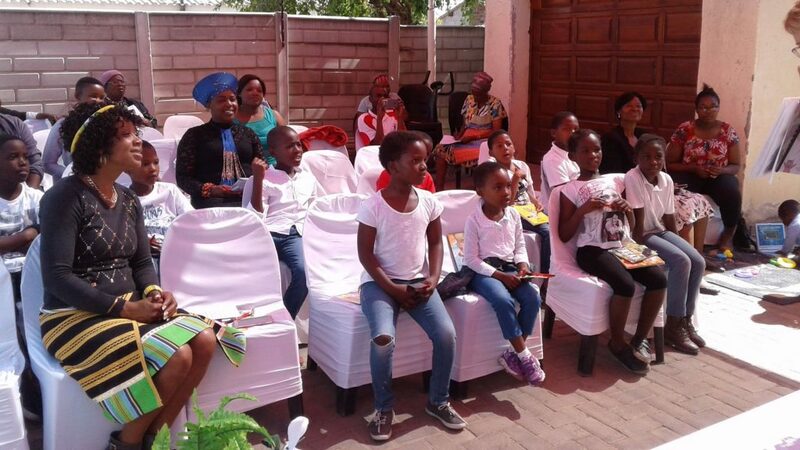 I was truly honored to be able to participate and see the level of commitment Phuti and these families and children have toward reading literacy. One side surprise Phuti had for me was a donkey cart ride around her neighborhood. 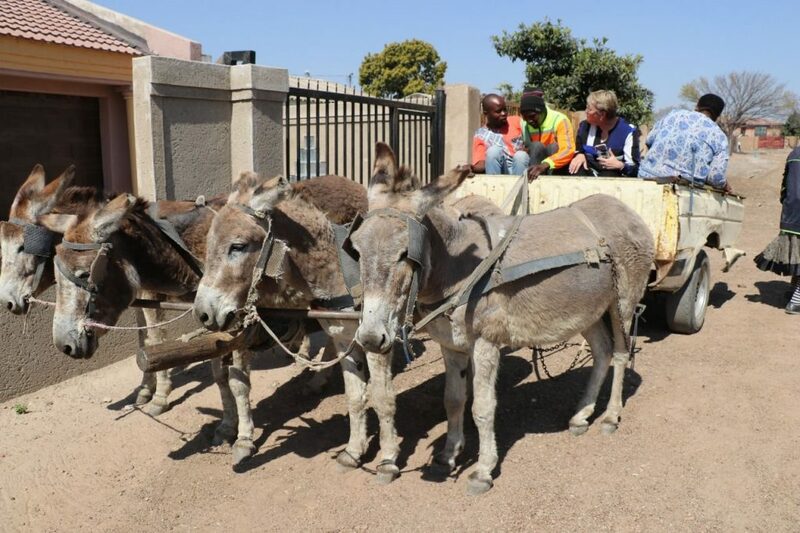 No, people don’t ride donkey carts all the time. This is definitely a means of transport from former days. 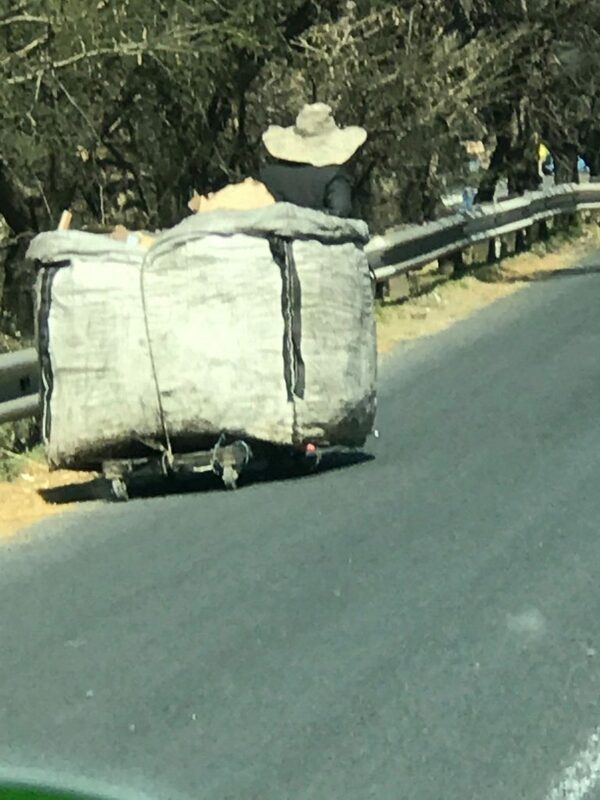 However, one young man does earn money for his family by using his donkey cart to haul dirt, rocks or anything someone needs from one place to the other. 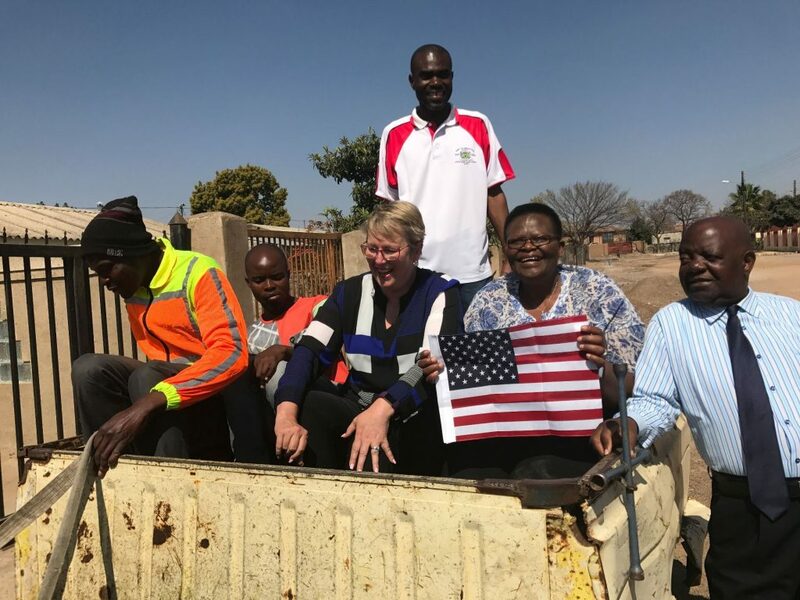 In this case, his goal was to haul one American and one South African teacher around the neighborhood for a funny ride! I have to admit I laughed for the entire time as people stopped us from the side of the road to take our photos. 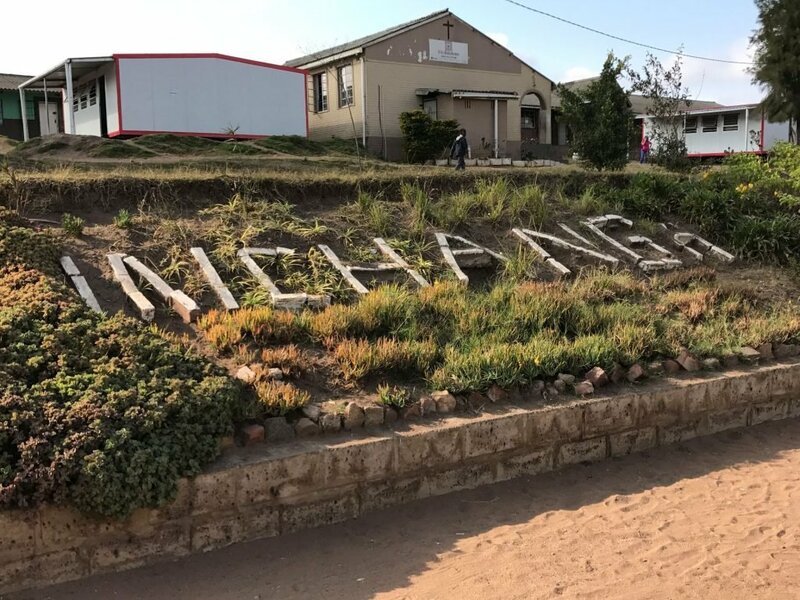 I hear the word “lekgowa” shouted from the sidewalks. Phuti explained that lekgowa means white woman. The sight of a white American woman in a predominately black neighborhood riding in the back of a donkey cart had everyone laughing. It was the surprise of day and we totally enjoyed our ride with our donkey cart friends. While there, our guide a Phuti demonstrated how to play some of the traditional games of the region. 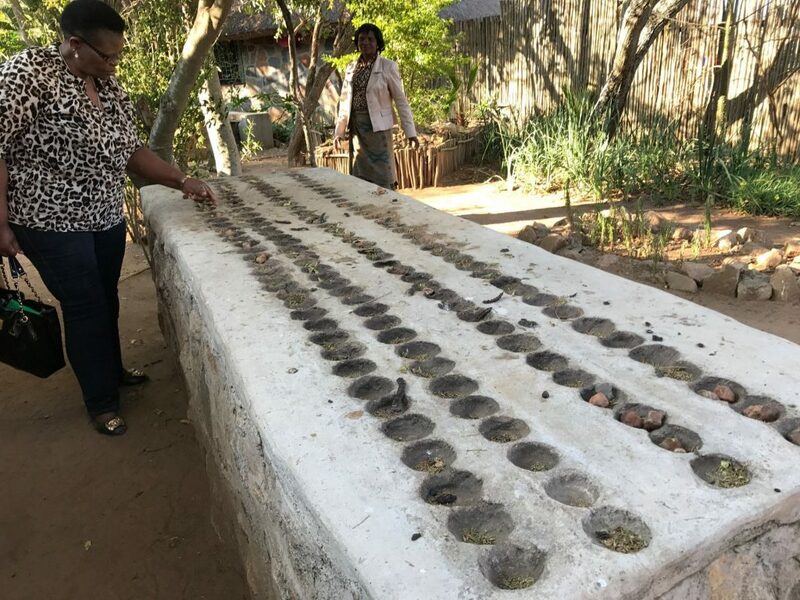 In the first photo stones are moved up and down the holes in a game similar to Mancala. 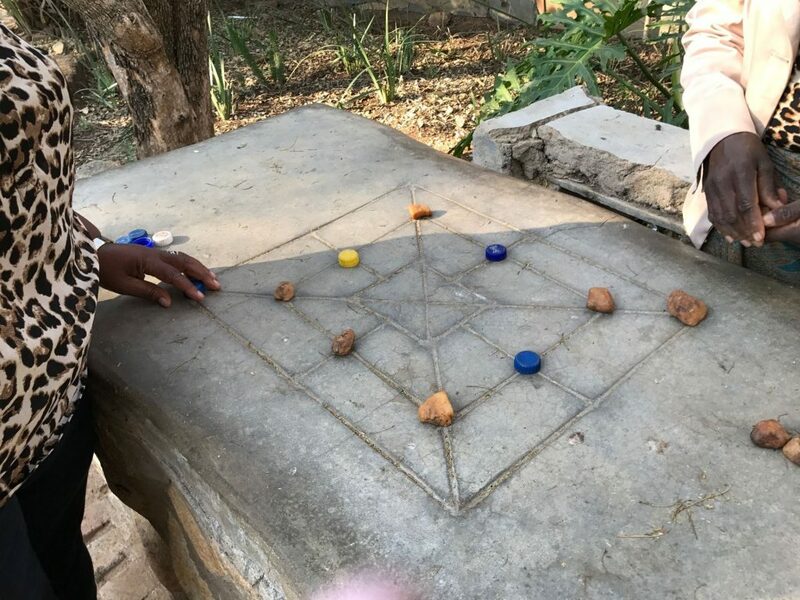 The game Morabaraba is a traditional two player strategy game played in South Africa. Similar to chess, the object is to move your pieces from one intersection to another until a winner emerges. 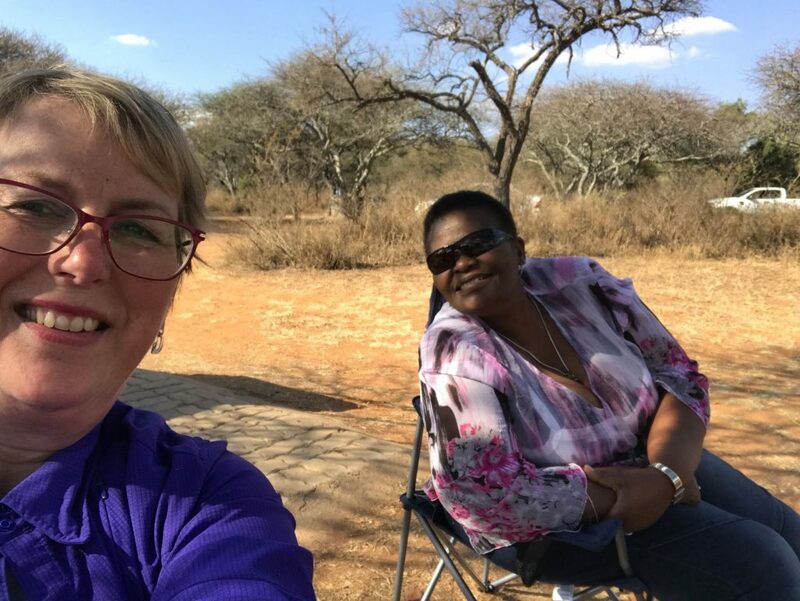 We visited a local game reserve and had a very relaxing picnic lunch. 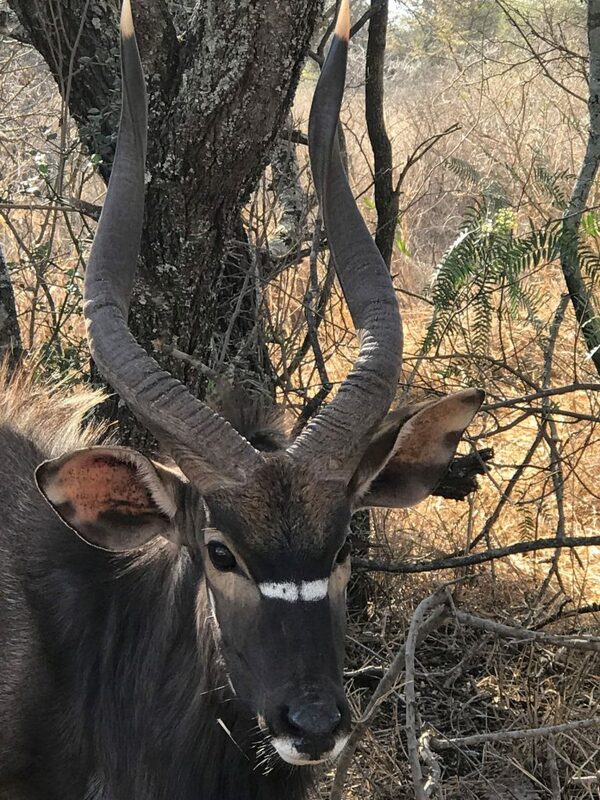 While there we became picnic friends with a female Kudu who was visiting each picnic area scrounging for food to eat. We talked to a woman carrying her baby on her back to make sure it would be okay for me to take her photo. 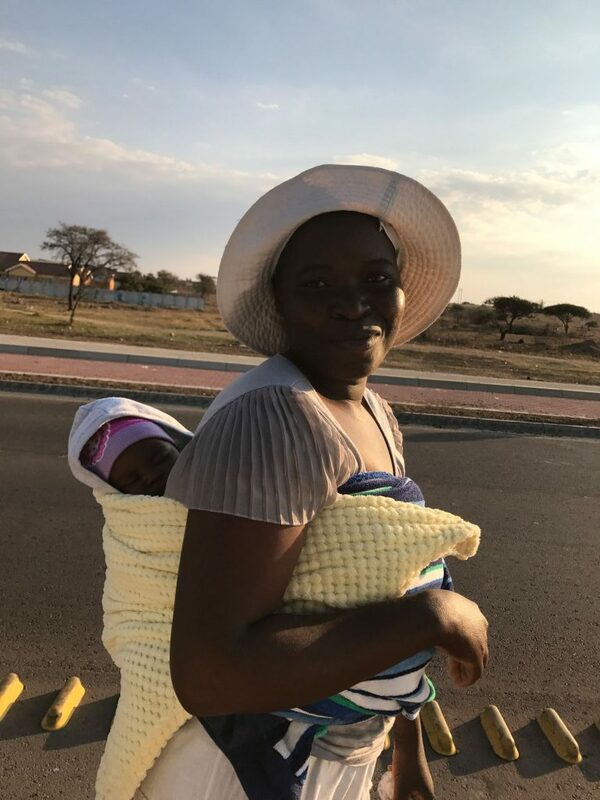 This method of carrying babies happens all over Africa. 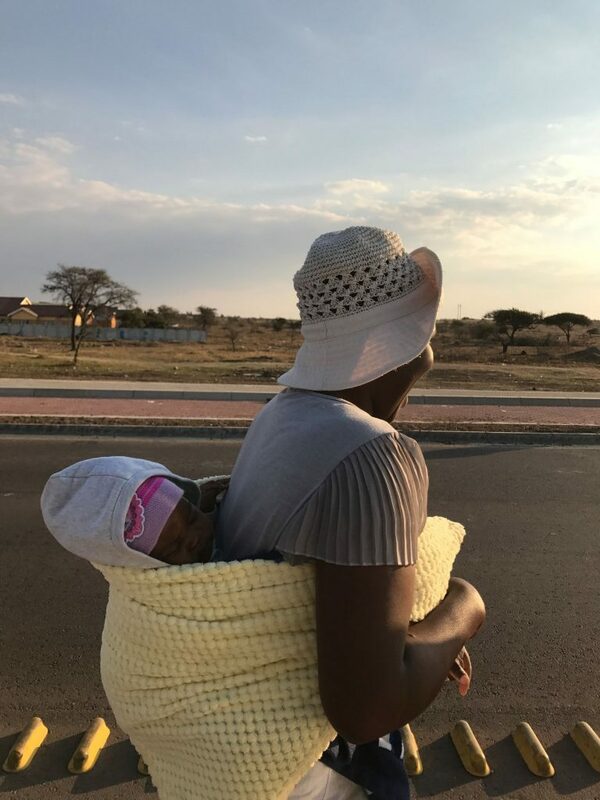 In the Limpopo region the word in the Sepedi language is Pepula, meaning “baby on the back”. 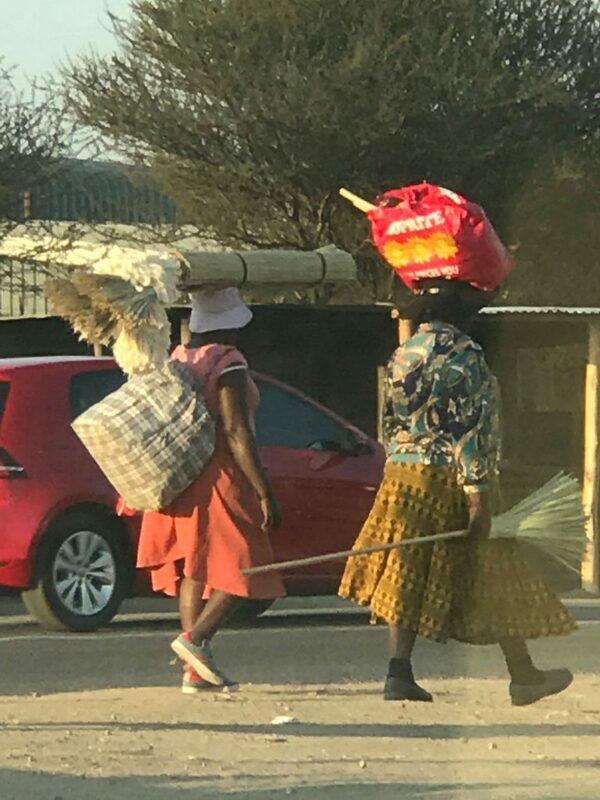 In rural areas quite common to see women carrying large loads on their heads as they walk down the street or men pulling recycling wagons down the street. That does not mean that all people use these traditional methods. I was just fascinated by the mixture of modern and traditional life. 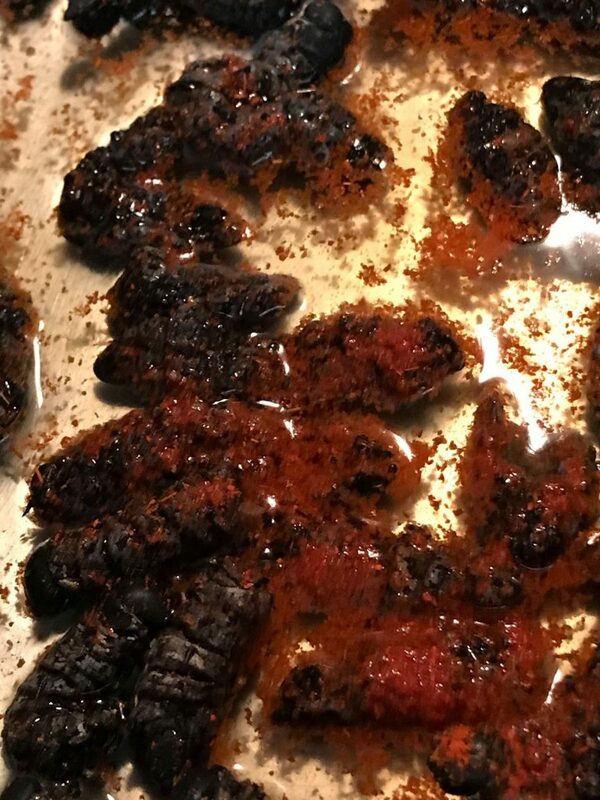 On my last evening in Polokwane, Phuti made me a special dinner of Mopane worms. In many cultures eating insects is viewed as a delicacy. This video explains more about the worms and how they are cooked. 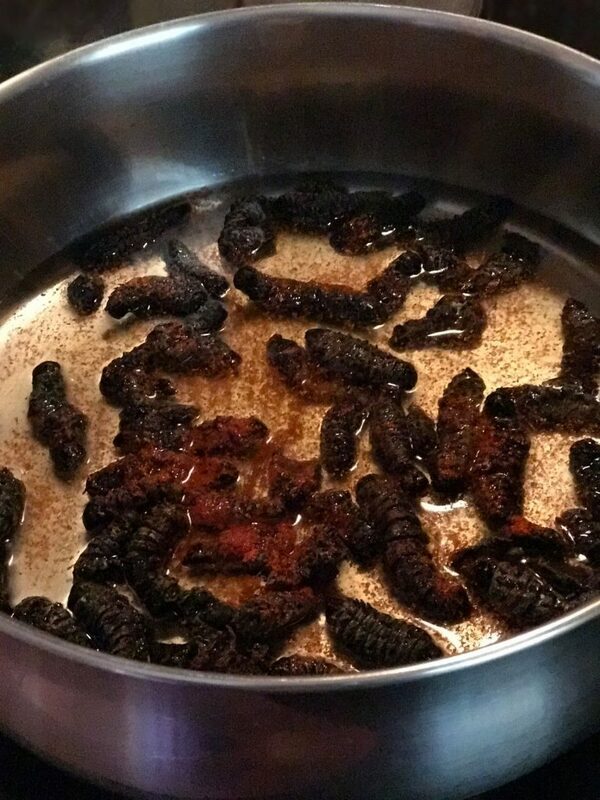 I fully admit while I watched Phuti cook the mopane worms, I was a little worried. I’m not a super adventurous eater. 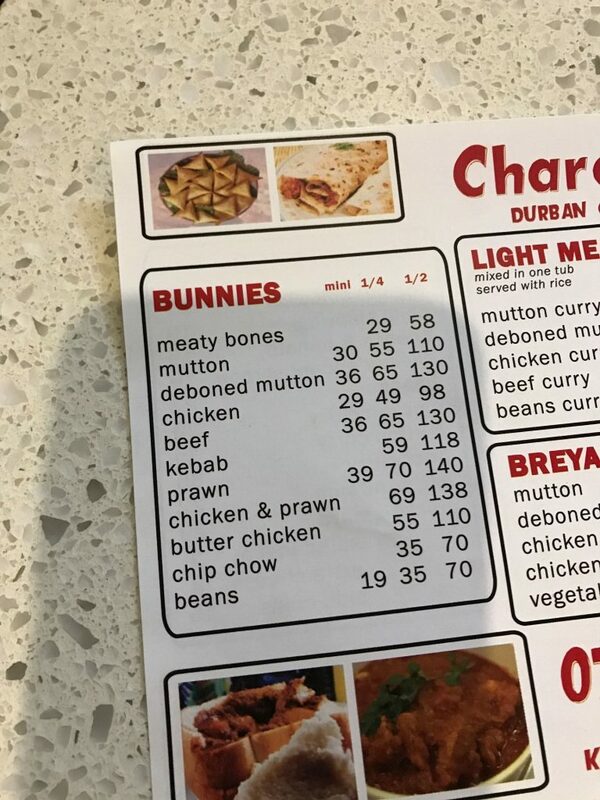 I wasn’t sure if I was going to be able to eating these strange looking creatures. 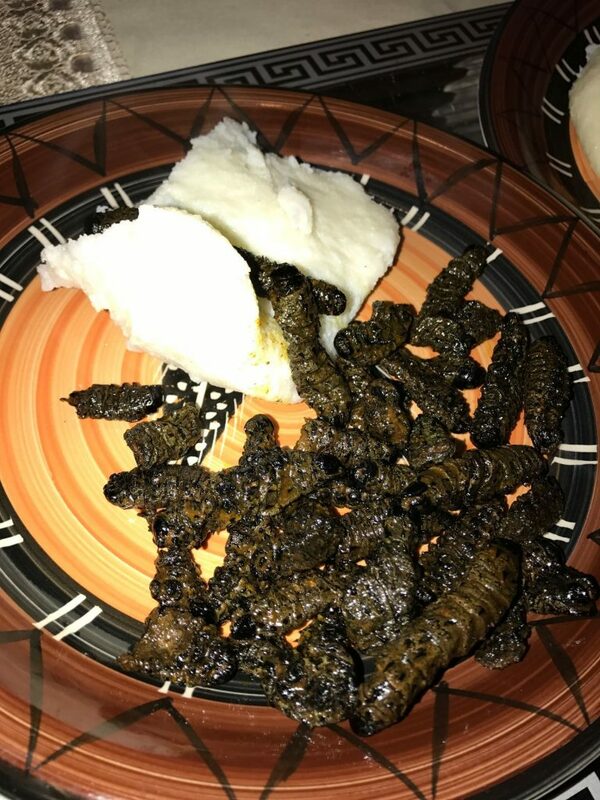 Phuti served with Mopane worms with pap, a traditional black African staple food made with finely ground maize meal. 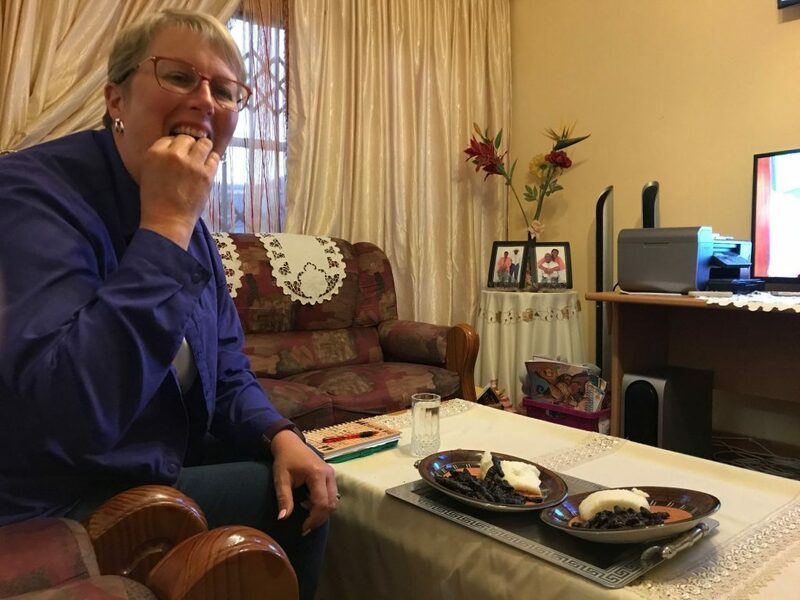 Each ethnic group in South Africa calls pap by a slightly different name, but basically it looks a little like very thick mashed potatoes or a soft polenta. 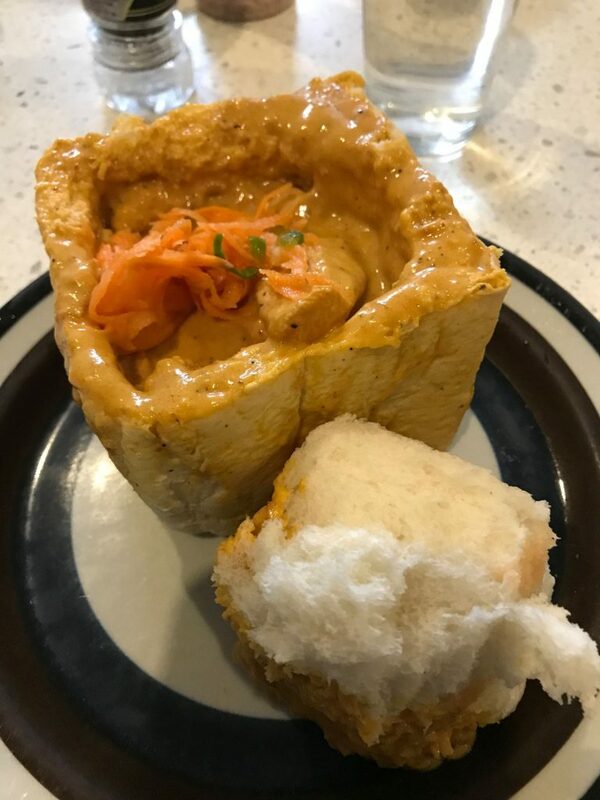 It’s served most often with a meat and gravy. 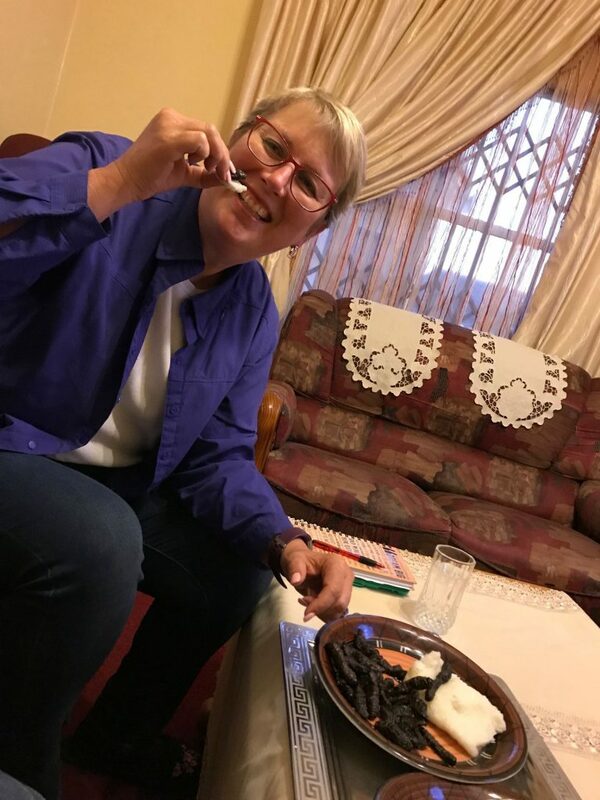 For our dinner we had pap and worms. 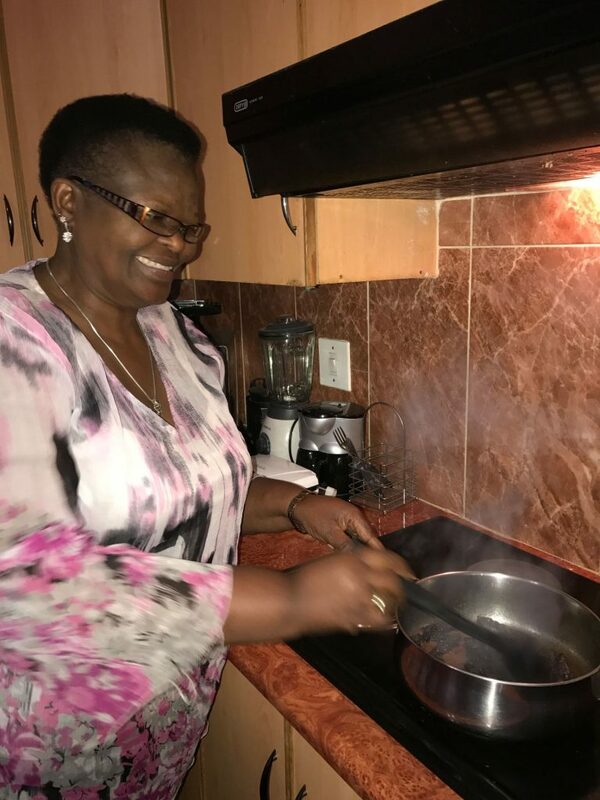 I decided since Phuti had gone to great effort to make this favorite delicacy, I would do my best to give it a try. I won’t lie – I couldn’t eat my entire plate. They tasted a lot like a very crisply cooked piece of thick bacon. A little crunchy and quite spicy. They really didn’t taste bad, but I couldn’t get my brain to quit reminding me that I was eating worms. I was also a little worried about my tummy knowing that I would be flying home the next day. I proudly ate 3 worms and called it quits! When it was time to leave, we mutually decided not to say goodbye. Instead we said, “Until next time”. I truly hope we will have another occasion to meet either there or here. 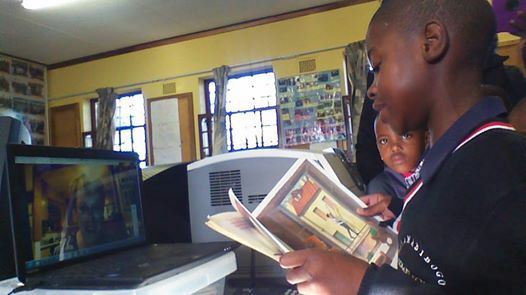 In the meantime, we will send books and I will Skype with the reading club on Saturdays. 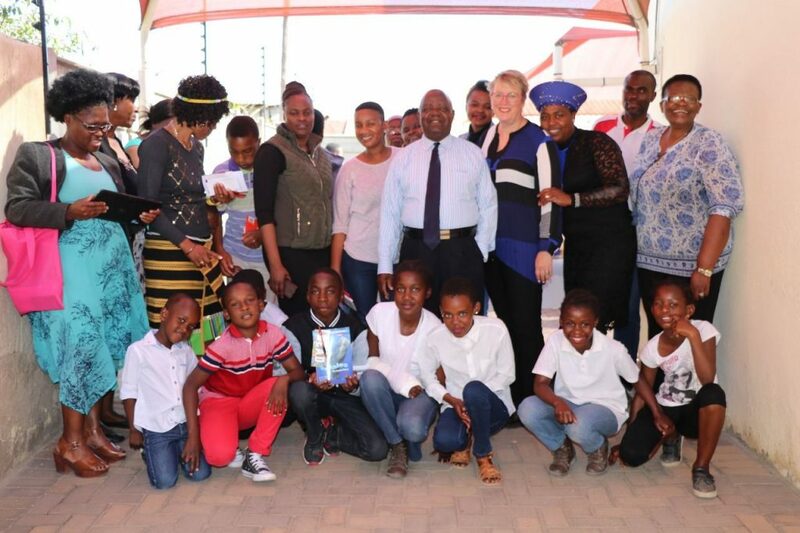 We will talk about their books and I will hope that through our combined efforts these children will become even better students in their regular schools. 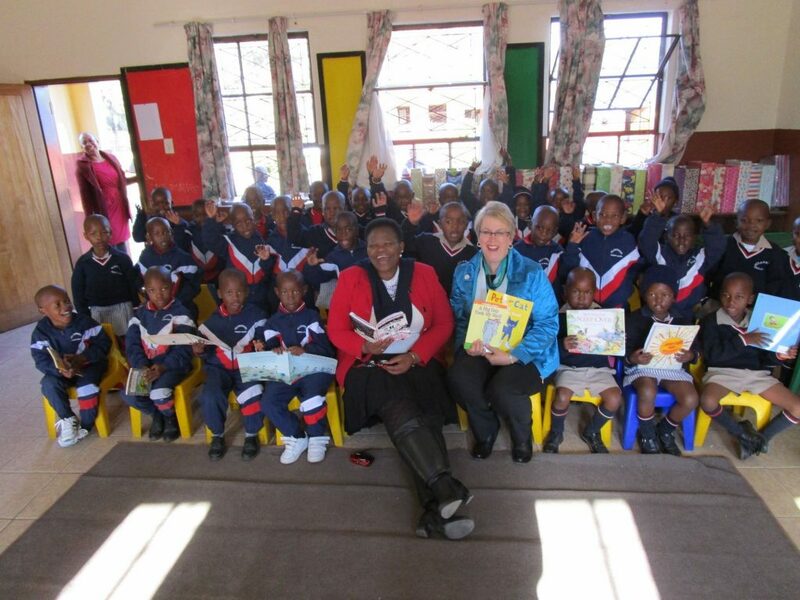 If you would like to learn more about the Books to Africa Partnership, please visit our blog. We are always looking for new partners from the US, who are committed to helping others. 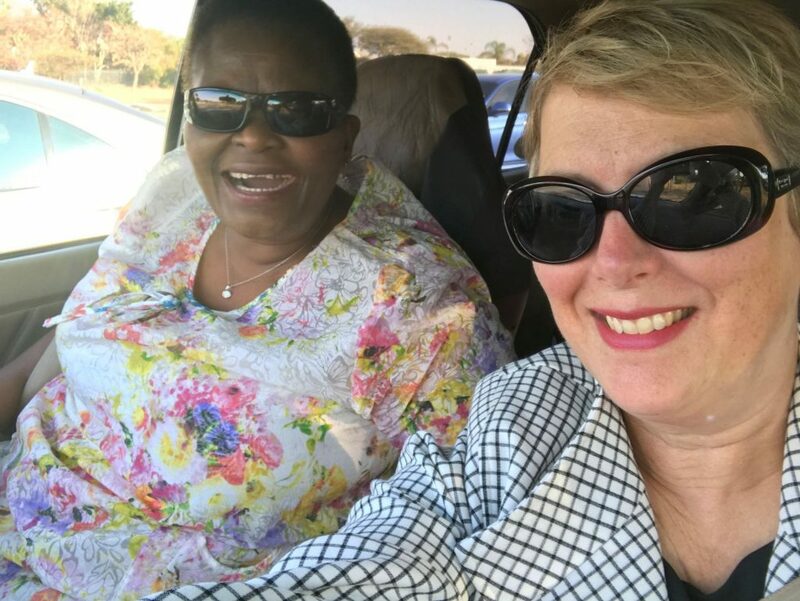 Thoughtful, dedicated, generous, sincere and a true friend – these are just a few of the words I can use to describe Des. She and her husband Rod welcomed me into their home two years ago, and once again they opened their home to me, for which I am so completely grateful. While we live the world away from each other, we are lifelong friends. 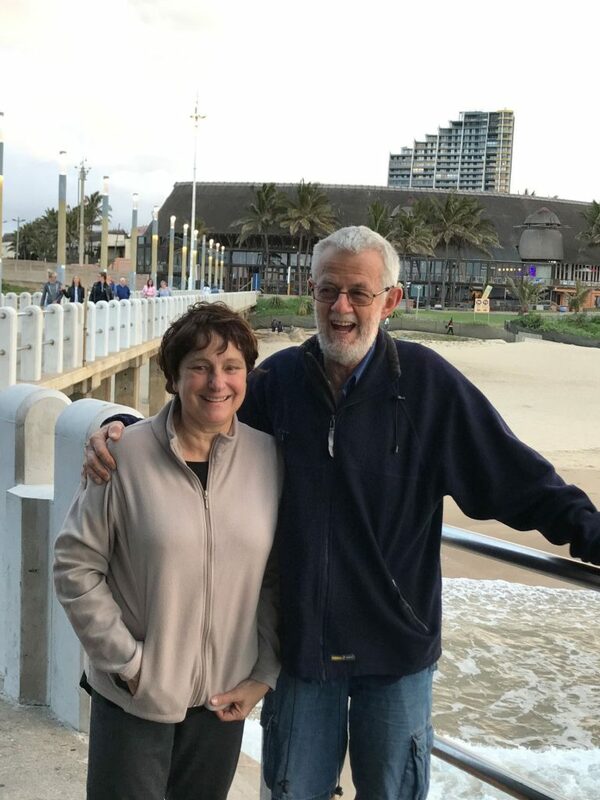 From sunset beach walks in Durban, a Bunnychow dinner, political discussions, long drives to Johannesburg and Limpopo Province as well as an unforgettable Safari experience, my trip would not have happened without their help. I can’t thank them enough for sharing their time, home and willingness to transport me near and far to help make my trip come together. Des has been my liaison with Highbury Preparatory Primary School for many years. 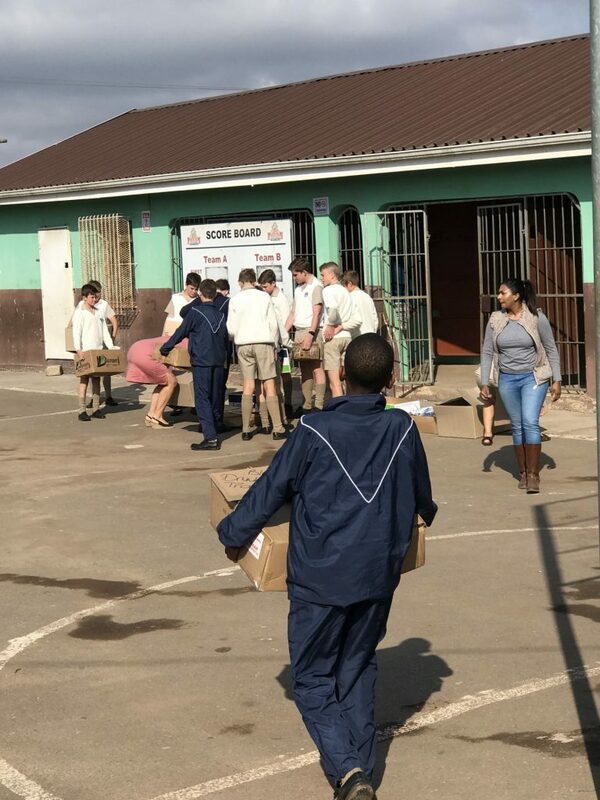 This private school believes in helping other less fortunate area schools and my Books to Africa project has been able to contribute to this relationship. Des recently retired from her technology teaching position there, but still works tirelessly to make sure the gardens are maintained. 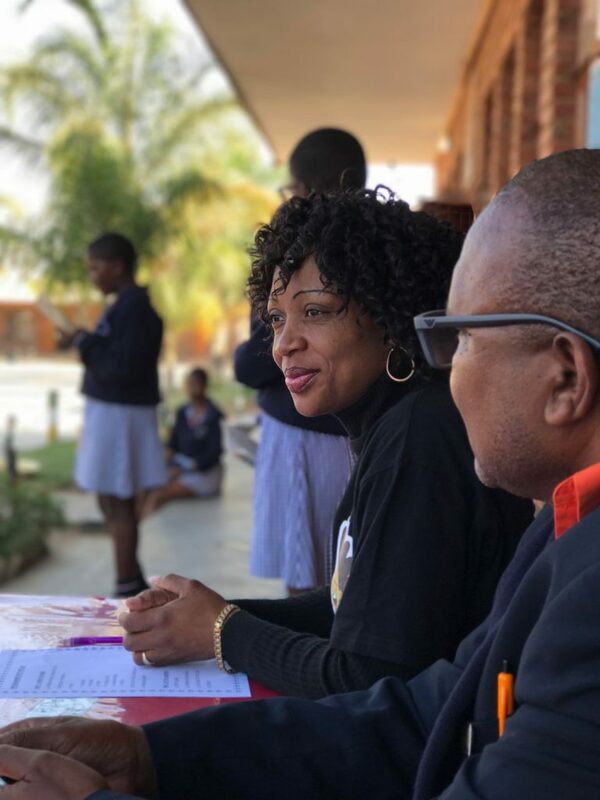 In addition, although retired, she is committed to helping the teachers and students with reading at Inchanga Primary School. This government school in the Valley of a Thousand Hills serves a very disadvantaged community with high needs for extra support. 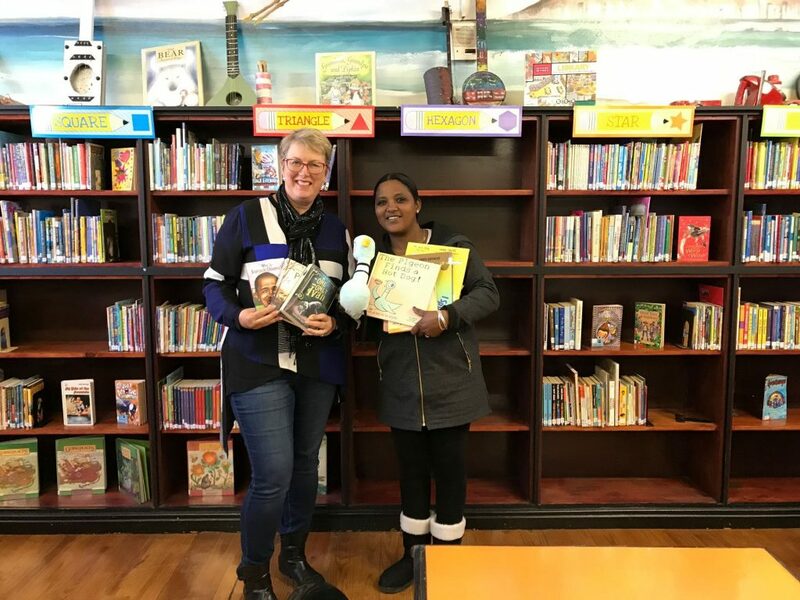 She has been providing guidance and support for the administration and teachers who have started the school’s very first library. 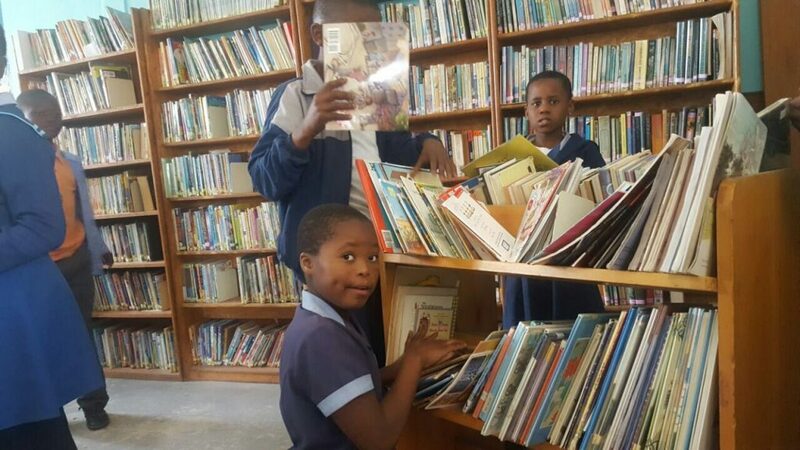 We have been able to donate some of the books for this library. 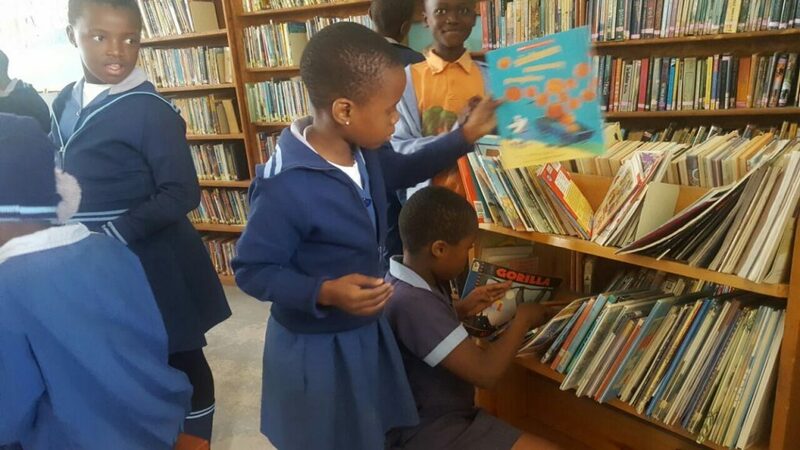 Having a library at a school with over 1,000 students and classrooms of at least 50-60 students brings a different set of issues to solve. The room is small, so 50 students can’t come at the same time with their teacher. There isn’t a librarian to oversee the children when they come without their teacher either. With some mobile carts or boxes and a willingness to figure it out, I know these teachers and Des will find a solution. 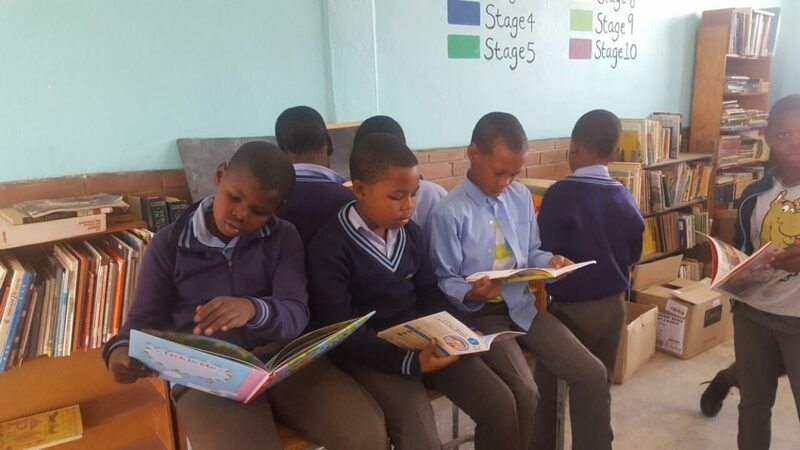 Reading and literacy is key in ensuring that these students have a quality primary education and a solid foundation for secondary school. 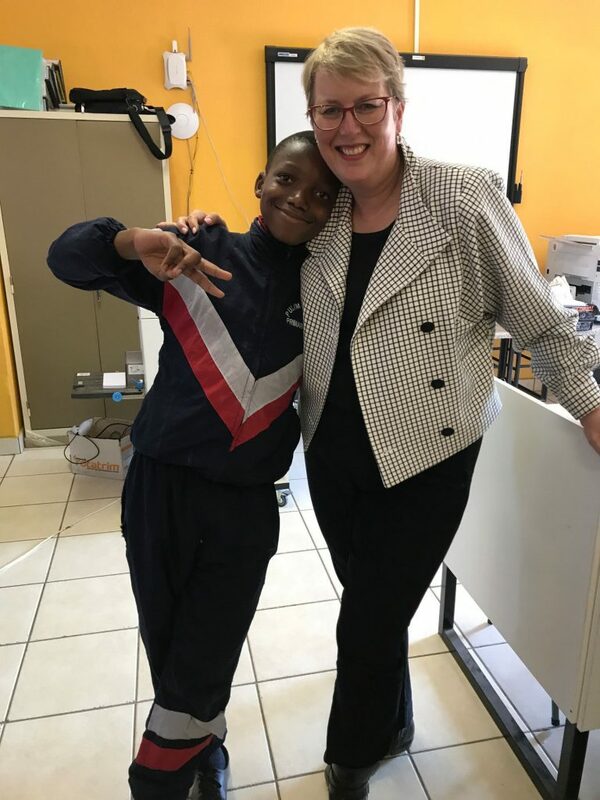 I was able to visit Inchanga on the same day that some of the 7th grade boys from Highbury Prep came to visit with their teacher Lynette. 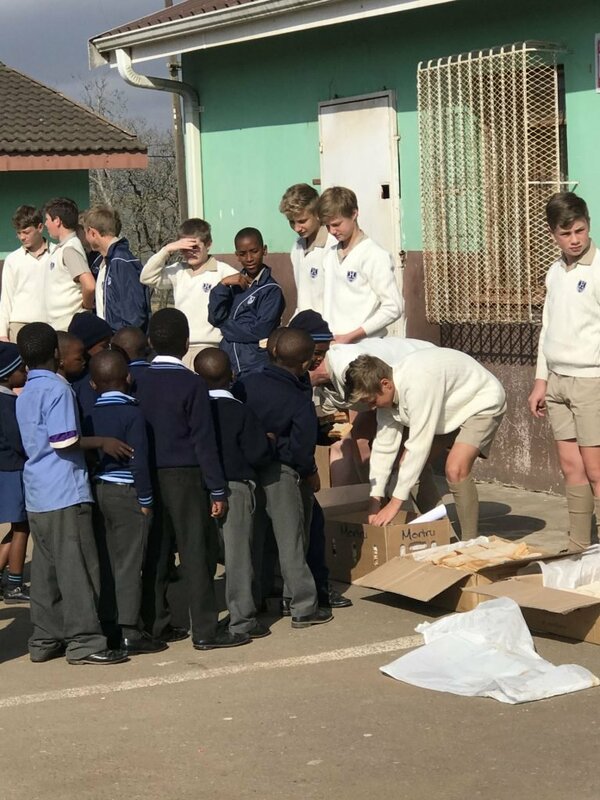 Armed with over a 1,000 sandwiches made by the boys back at school as part of their Mandela 67 minute community project, we handed out lunch to the entire student body. 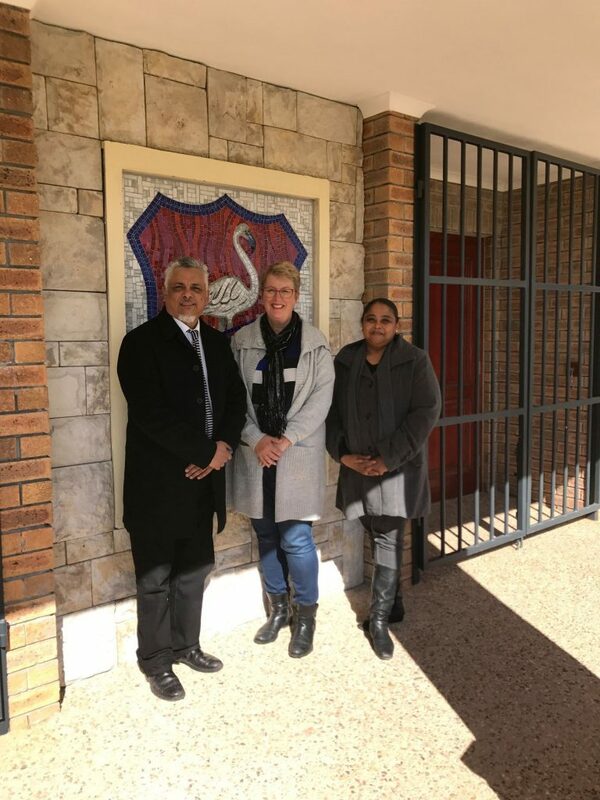 After I was able to meet with their Headmaster and the language arts teachers to talk about how our reading program can further assist their literacy initiative. 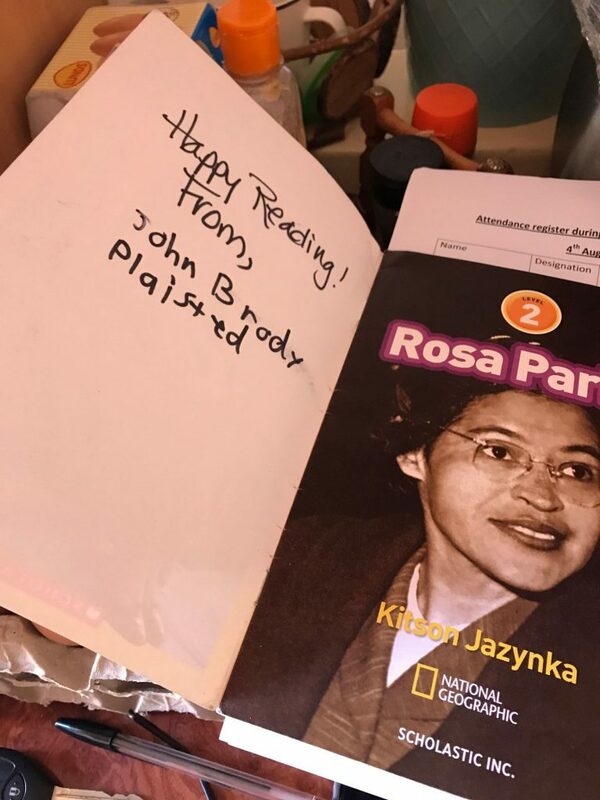 It is always special to see books that our teachers or students donated in the hands of young readers thousands of miles away. 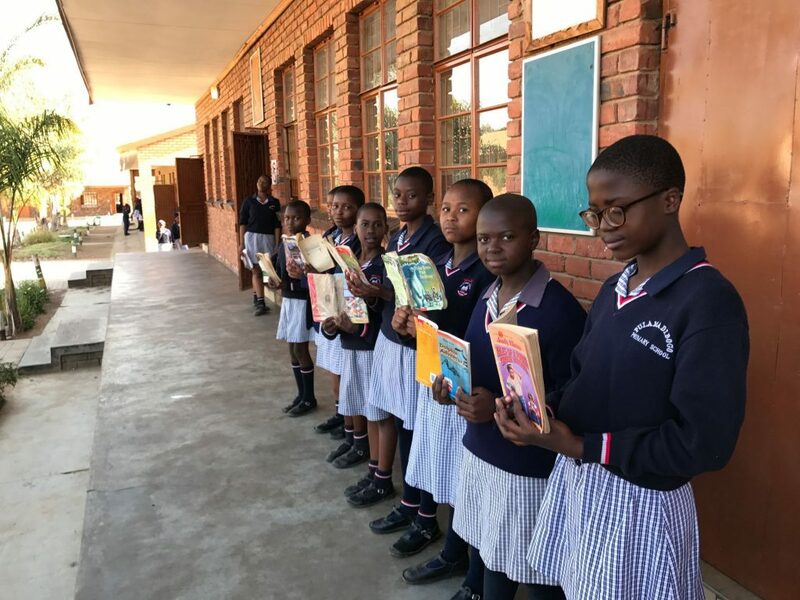 Witnessing the impact that our students have on their peers by donating books and sending them overseas gives credence to the term agents of change. 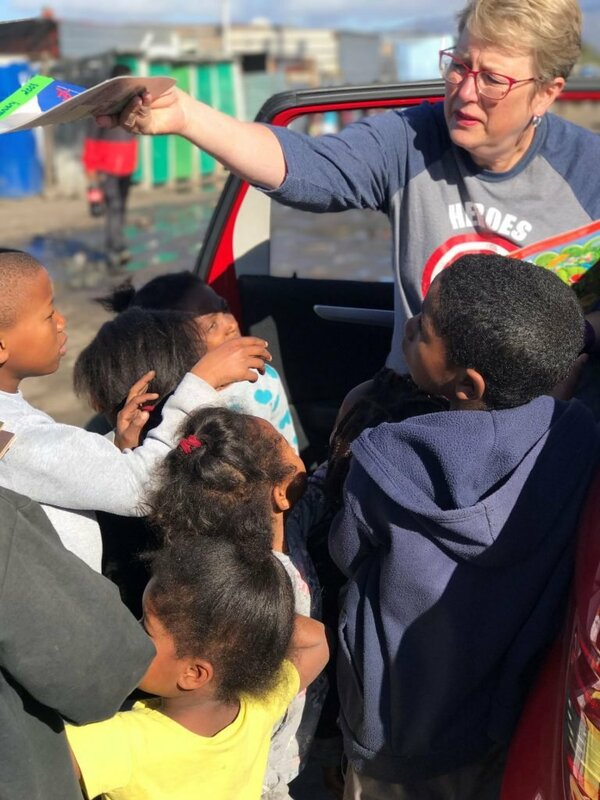 They are making a difference one book at a time. I am very fortunate because I have enough food to eat on a daily basis. I have a job that pays enough for my shelter, food and extras that I need. However, there are thousands of children who wake up hungry everyday. 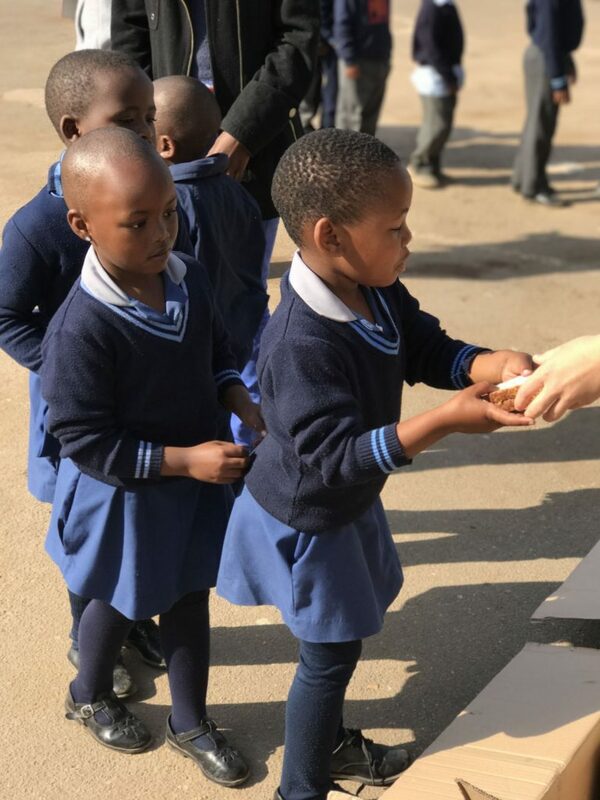 According to a 2014 blog post published by Bordon Project, a nonprofit agency that addresses poverty and hunger, over 11 million South African children are unsure when or where they will get their next meal. Jobs are scarce or pay very little and directly influence the amount of food parents can provide for their children. When children come to school undernurished or suffer from the effects of a lack of proper nutrients, it makes learning even more difficult. Without proper nutrition, the full capacity of what a child can achieve educationally is dramatically reduced. I had the great fortune to meet a person who have devoted a major portion of her life helping feed vulnerable and impoverished children. I believe she is a lifesaver for many needy children. 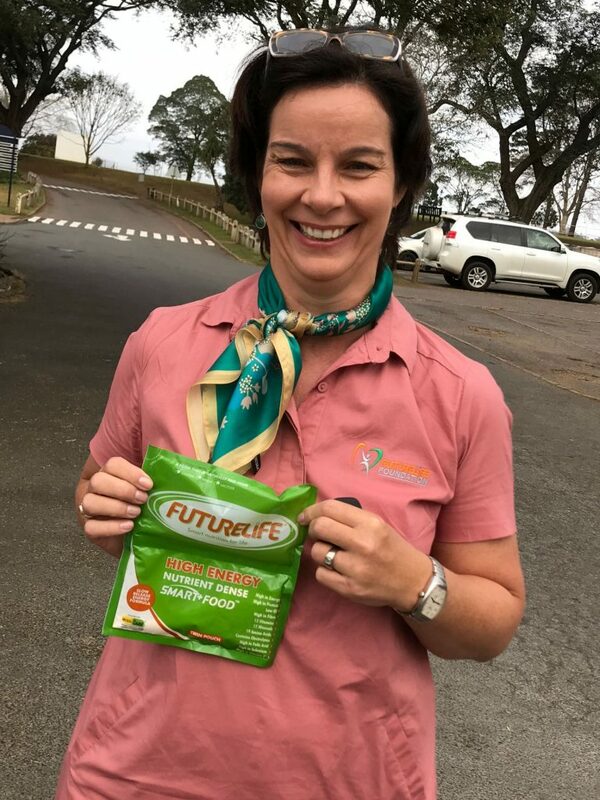 Julika Falconer is the CEO of FutureLife Foundation, the charity arm of FutureLife, a company which has supplied over 9 million nutritious meals to needy children since 2009. 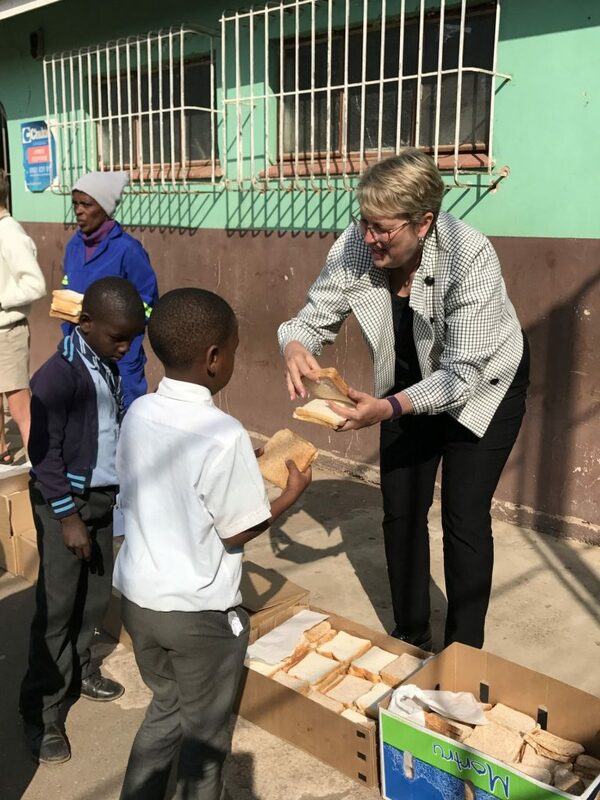 She has been instrumental in finding financial sponsors so the children at Inchanga Primary School where I visited can begin their day with a nutritious breakfast. Having breakfast has positively impacted the learning for the children at Inchanga. 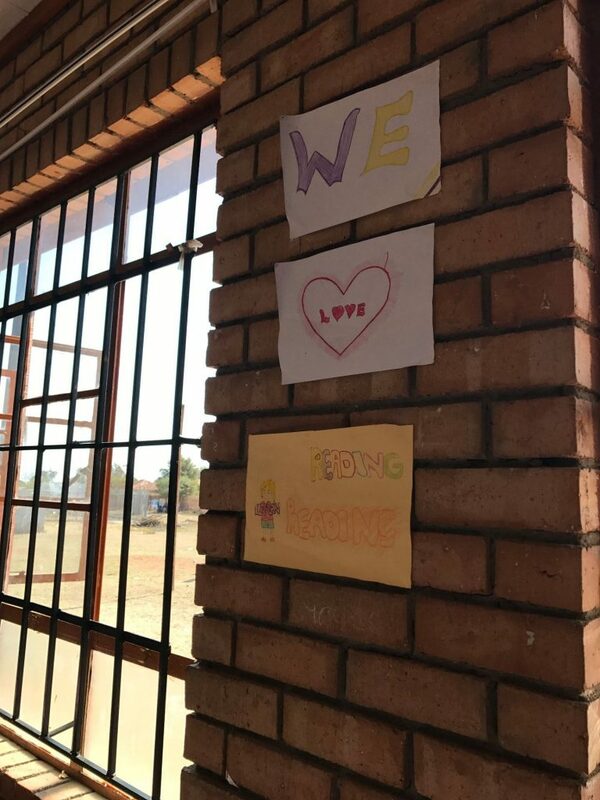 Instead of starting their day hungry, they are able to have a quick nutritious meal and then have the capacity to concentrate on their lessons and do better in school. What was most striking about the food packet was that nothing else was needed to eat. Children didn’t need a separate spoon, cup or dish. They could simply compress the packet to open the middle seal, rub the pouch, tear open a corner and drink the contents. The plastic bags are then collected, recycled and made into hard plastic benches which are donated back to the school. The program is a winner from all sides of the table. 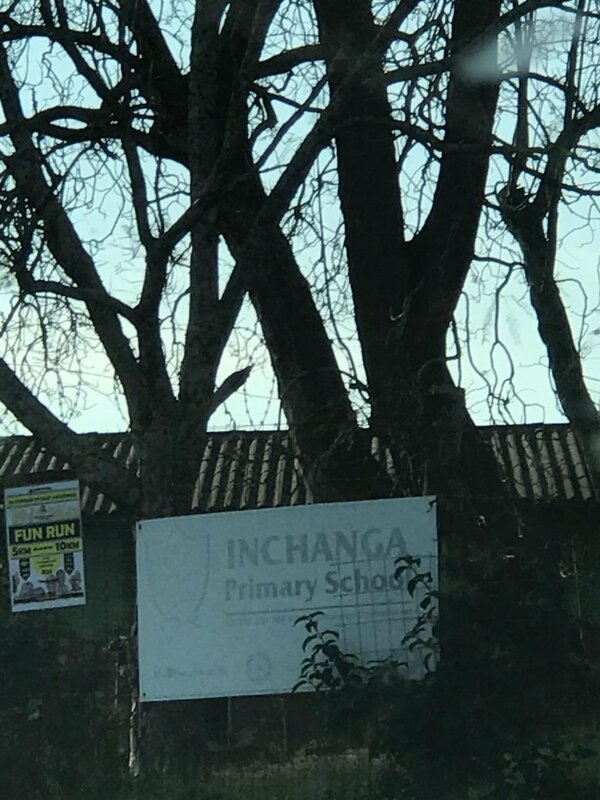 I look forward to working more closely with the staff at Inchanga knowing that they are linking forces with as many agencies as possible to make sure their students can achieve their full potential. This blog posted was cross-published on my Books to Africa Partnership blog site. 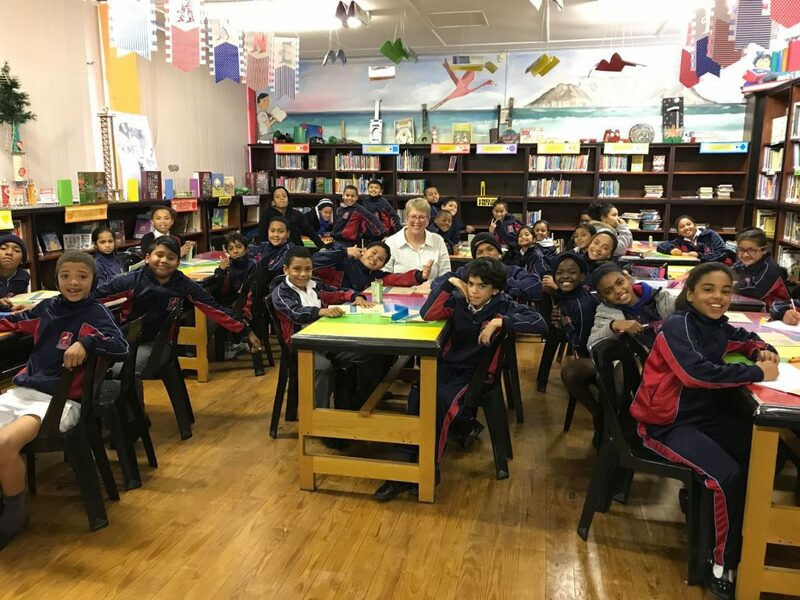 This post is the third in a series about my experience while teaching and traveling this summer in South Africa. The first post can be found here, and second post here. It is also cross-posted on my Books to Africa blog. 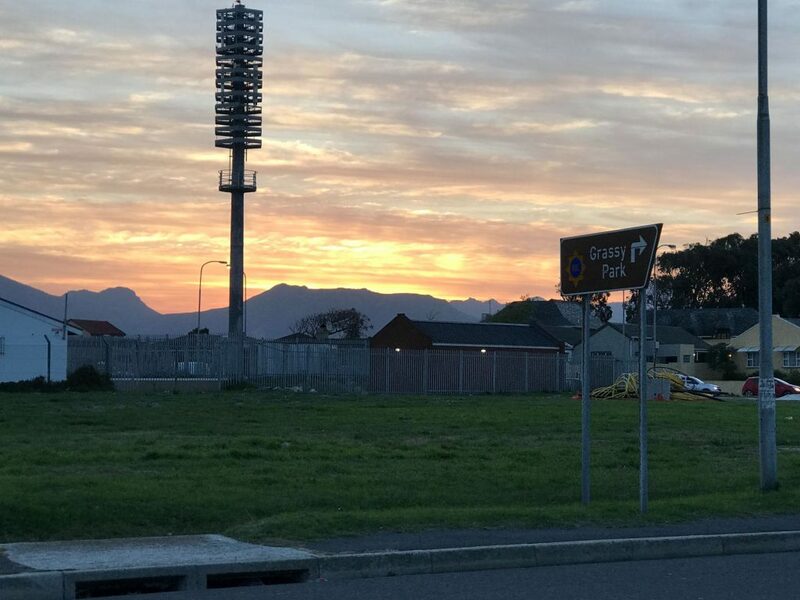 Half of my trip to South Africa this time was spent in Grassy Park, a suburb community of Cape Town. 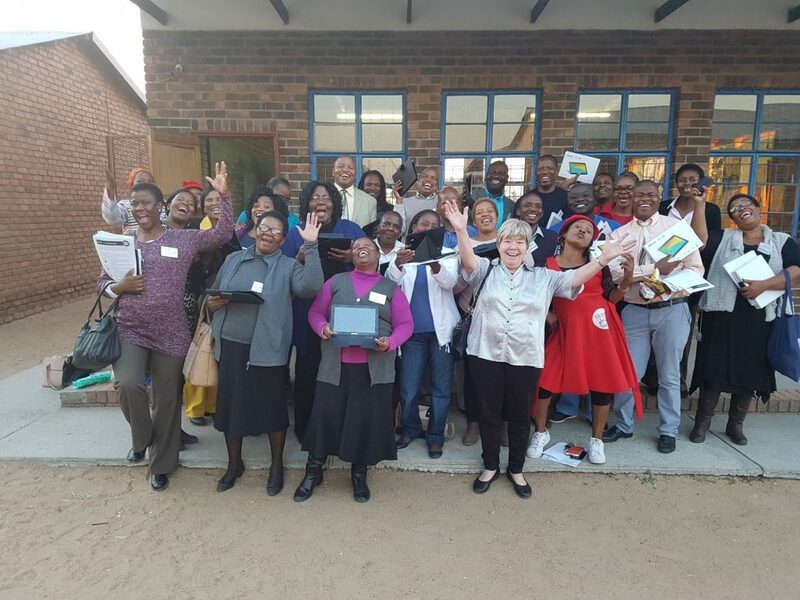 I spent two weeks at Kannemeyer Primary School volunteering with teachers, students and the school librarian with the organization Volunteering Solutions and SASTS Working Solutions. 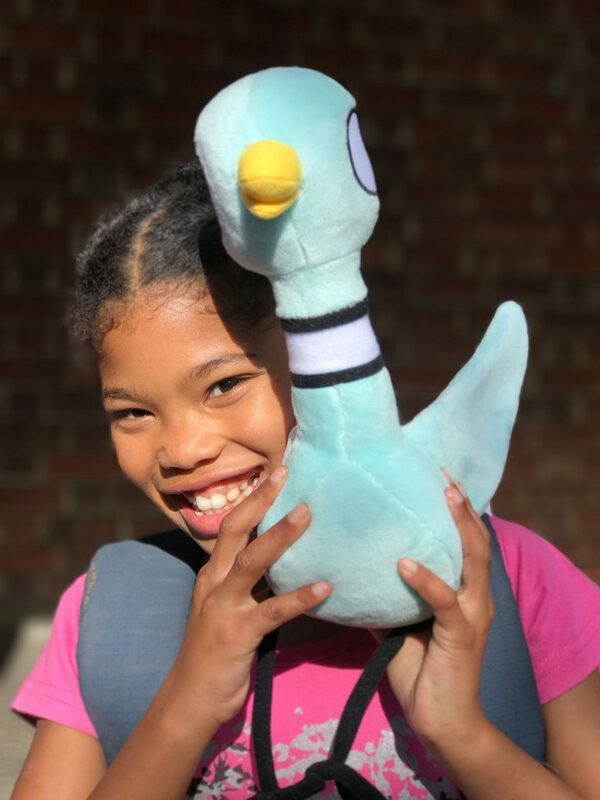 I demonstrated some different ways to share literature with students and got quickly known by the students as the “Pigeon Lady” because I had my pigeon puppet with me for most lessons. I observed teachers using techniques we use here in the US in the lower grades. Children were engaged in their learning and eager to raise their hands and share what they knew. 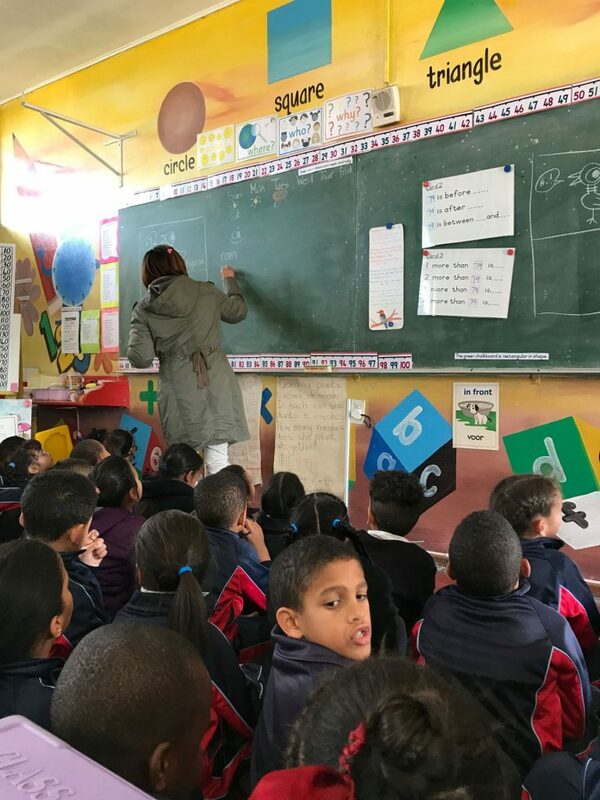 The classes were very interactive and unlike others I’d observed in the different schools where students had to sit quietly and copy words off the board. 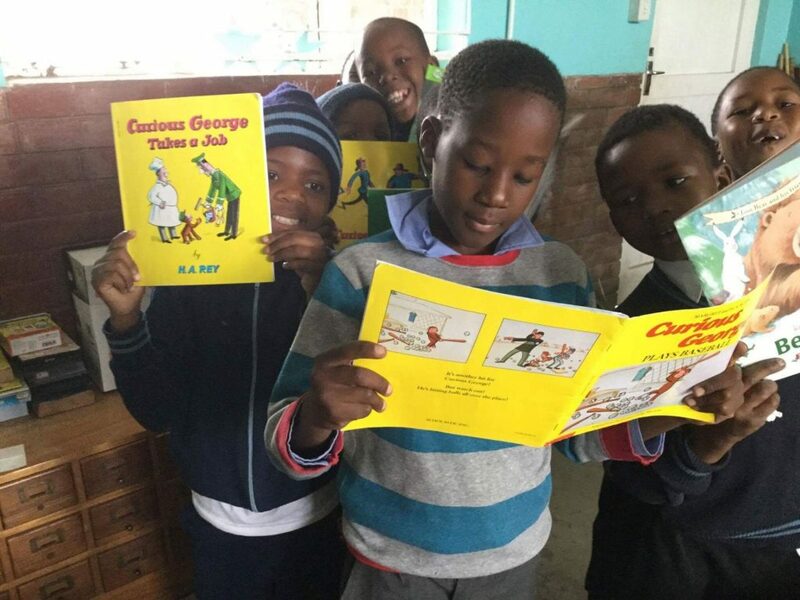 During one lesson in the 2nd grade class, the children were reading a story in Afrikaans. As I listened, I suddenly realized that this story seemed familiar. 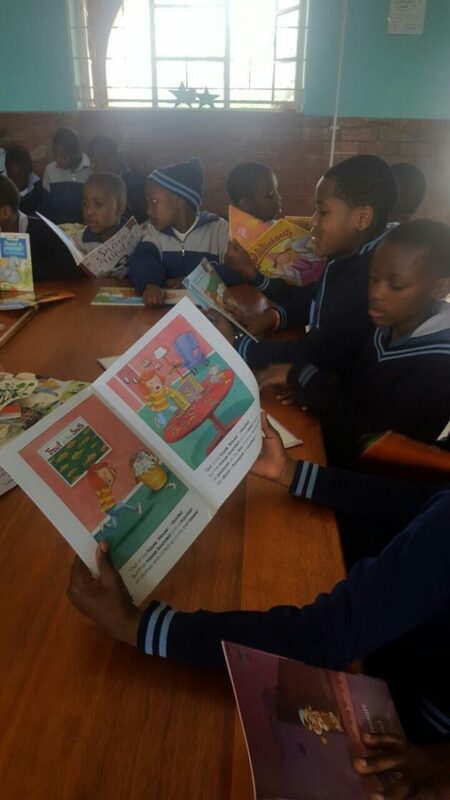 The children were reading The Three Little Pigs in Afrikaans! While I was there everyone painted a rock to be placed in the Inspiration Pathway. 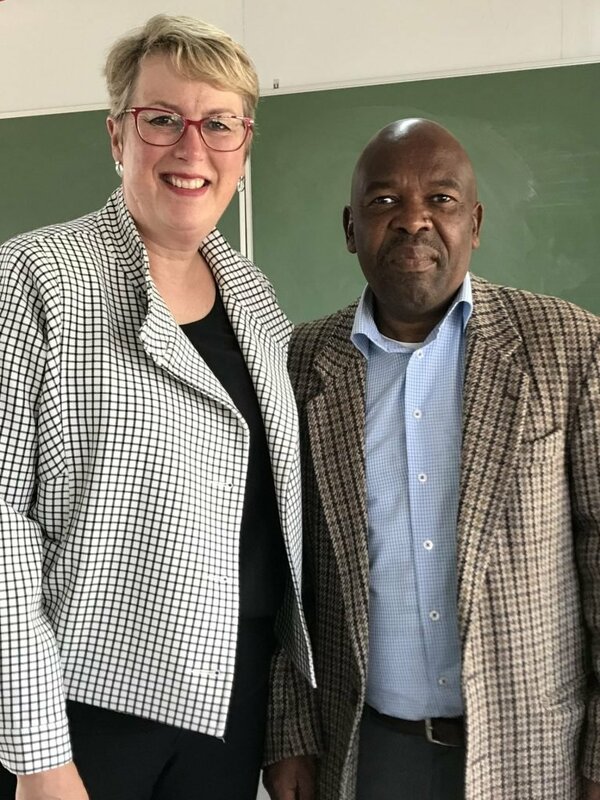 Headmaster Mr. Samodien and Deputy Headmaster Mrs. Ross work hard to create a school with a positive culture where children want to come to learn. 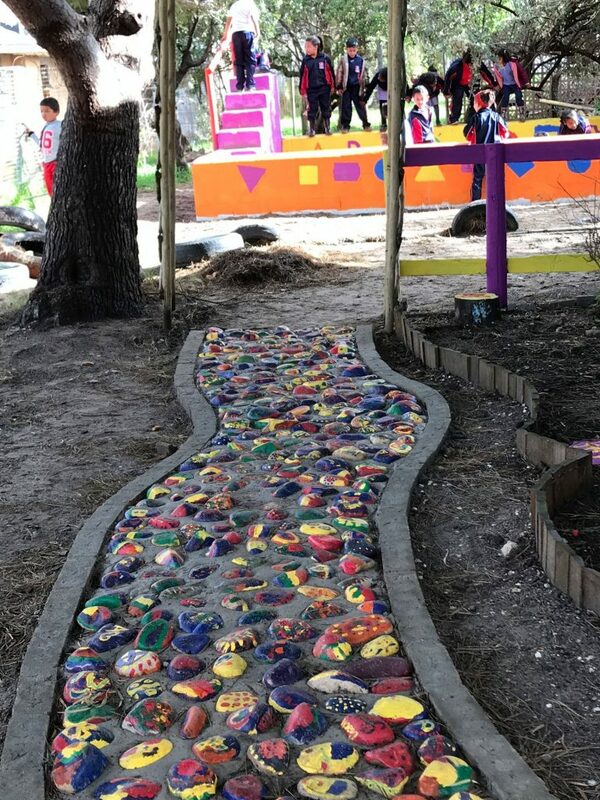 The rocks were placed in an area with seats and trees where the children could sit quietly if they needed a moment alone. 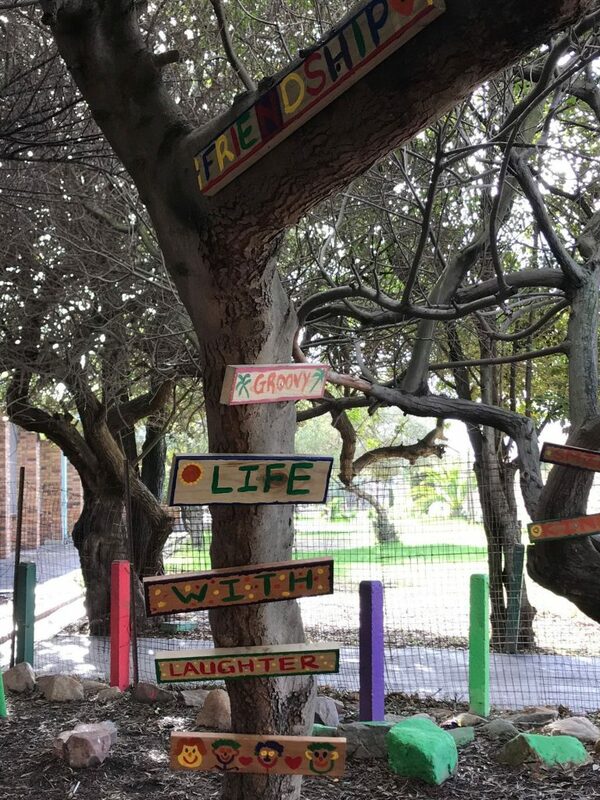 There are signs around the grounds with positive messages and colorful play areas. Most of the classrooms have gorgeously painted murals. He also strongly believes in the importance of having a school wide reading culture. 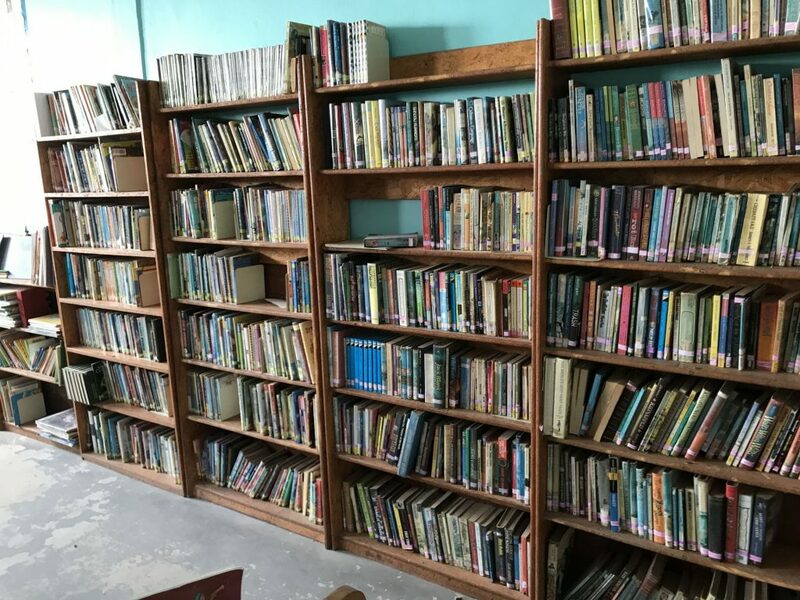 Just the fact that the school even has a library is a huge indicator of the commitment the administration has in ensuring that their students get the best possible opportunities despite the huge financial constraints they face. I loved helping Mrs. Willemse in the library. She quickly put me to work sorting through and re-organizing the fiction section so students could more readily find books to read. ​I spent one day in the computer lab with the Tech teacher Mrs. Beukes. At the surface level it was terrific seeing that the school had a computer lab, white board and projector. Yet the reality is that the CPUs were running Windows XP and barely able to withstand the daily use from running even the most basic of programs. 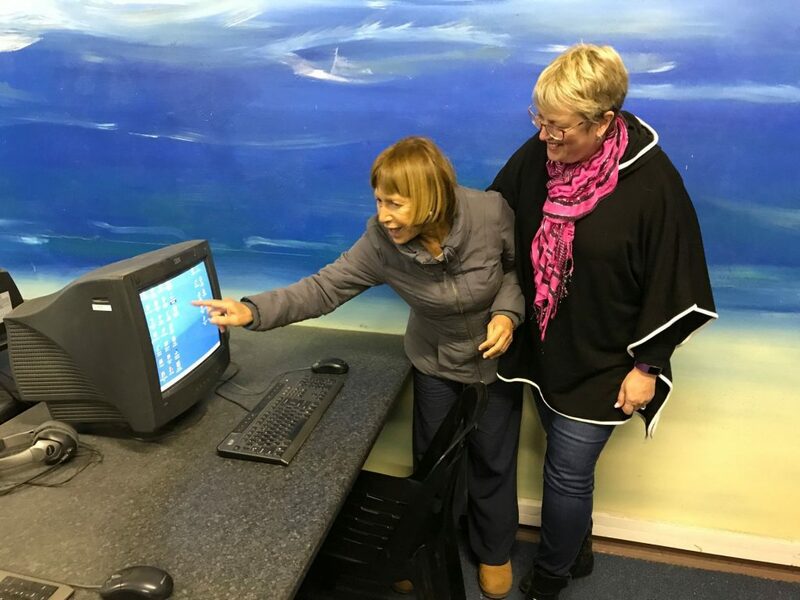 The teacher and technician used all of their combined skills to keep the computers functioning. The result was that sometimes when students came to the lab to work on a project were more often frustrated by the experience than learning. Technology is a complicated arena in underfunded government schools. 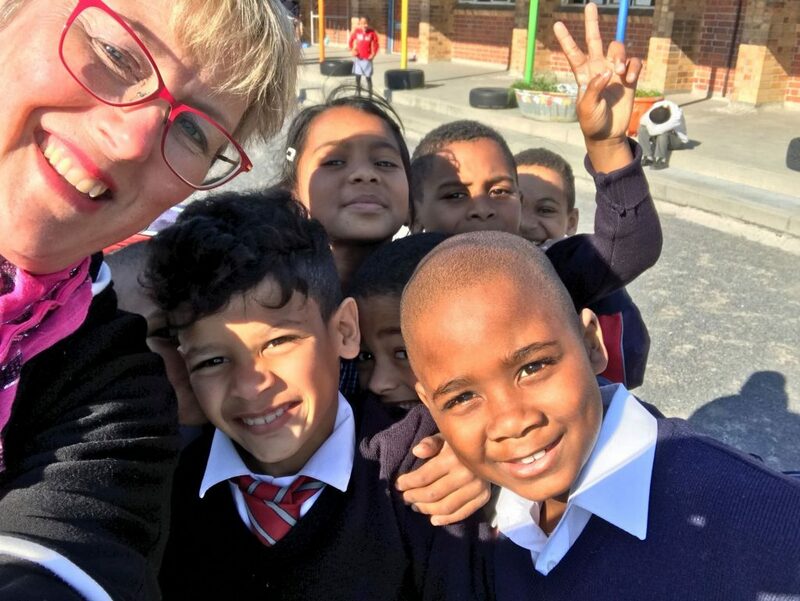 I had many conversations with different teachers around South Africa about this subject. The biggest factors are lack of funding, old equipment, and poor or expensive internet connections. 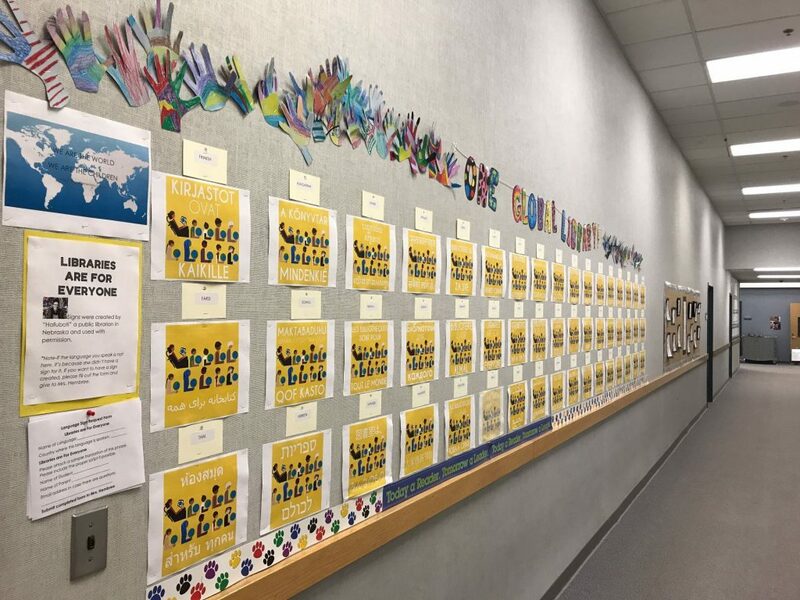 I saw multiple schools where computers were donated, but the continued support was not. Without a qualified technician to keep the equipment working and a budget to make sure this happens, computer labs don’t last long. I hope that soon they will find a benefactor who will donate some new or almost new computers to the school. 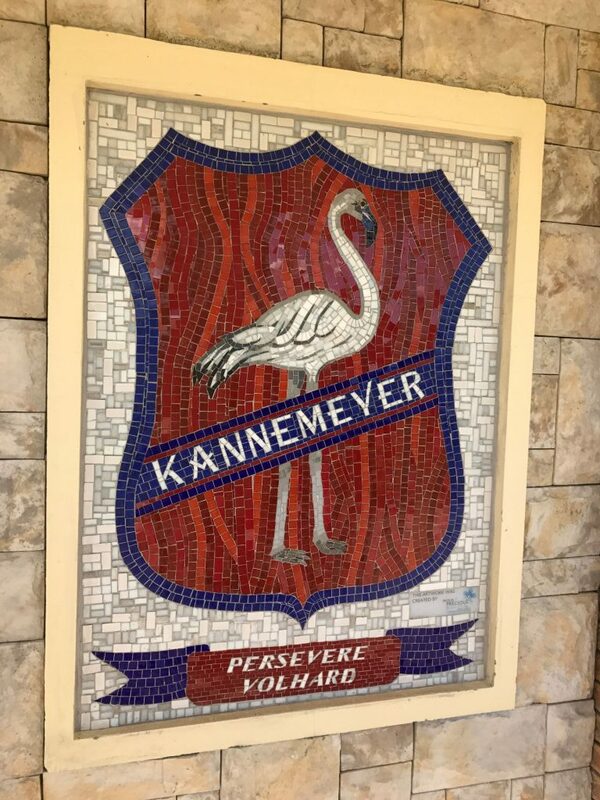 On my last afternoon at Kannemeyer, I met with Mr. Samodien and Mrs. Ross where we talked about the future of Kannemeyer. We discussed ways to deepen the reading culture at the school. Many of their students do not come from homes where reading has been nurtured at a family level. 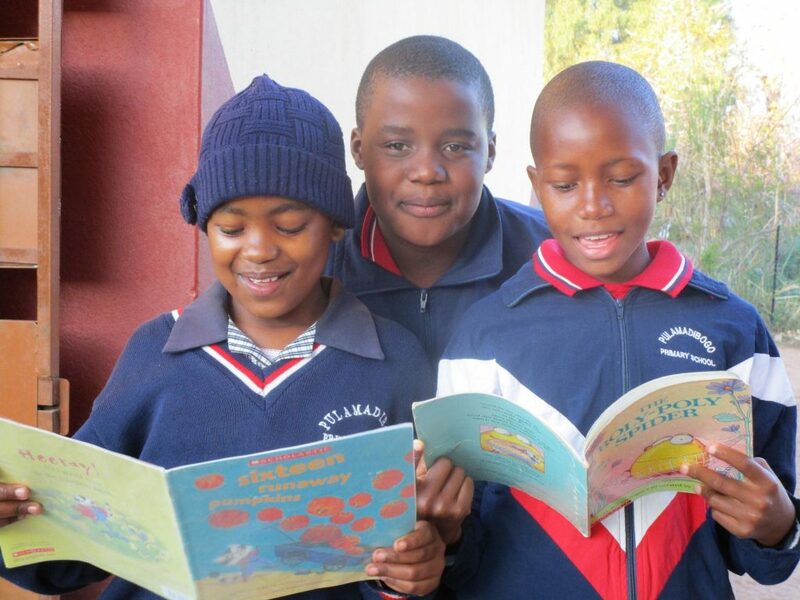 As a result, school is the first experience children have had with literacy and reading. I encouraged them to keep up the great work they are doing. 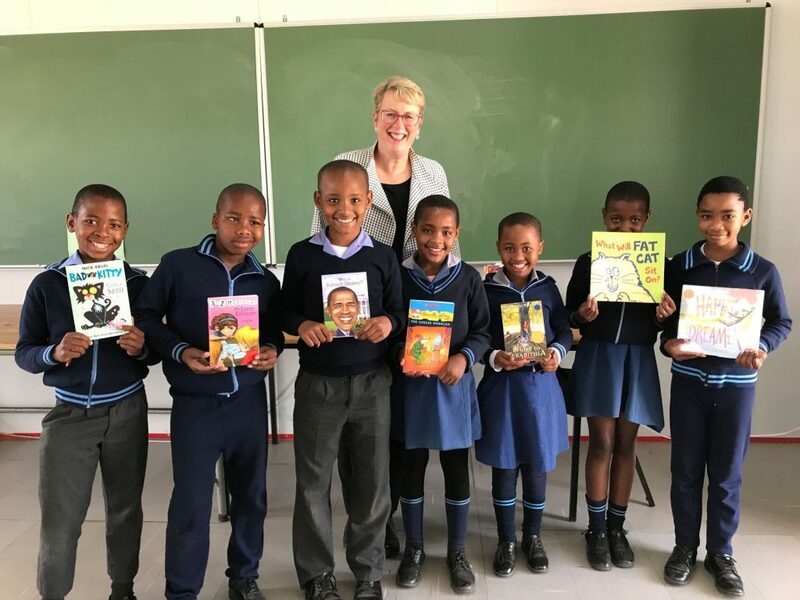 After our conversation, I am happy to announce that our Books to Africa program has added Kannemeyer to our Books to Africa partnership. We also hope to be able to Skype together in the future and build a partnership between our schools. 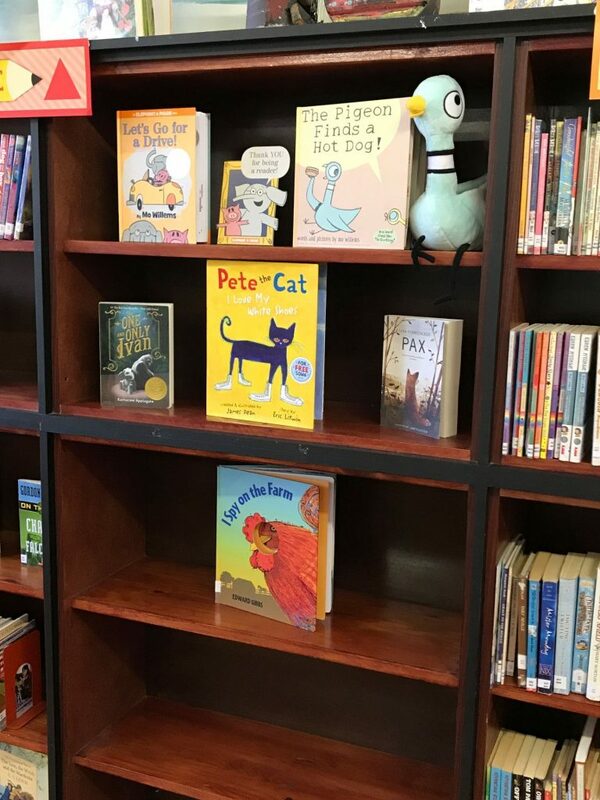 I left Kannemeyer with some new novels to read aloud to classes and some favorite pictures books and one very popular Pigeon puppet. I am also hopeful about how we can work together in the future. 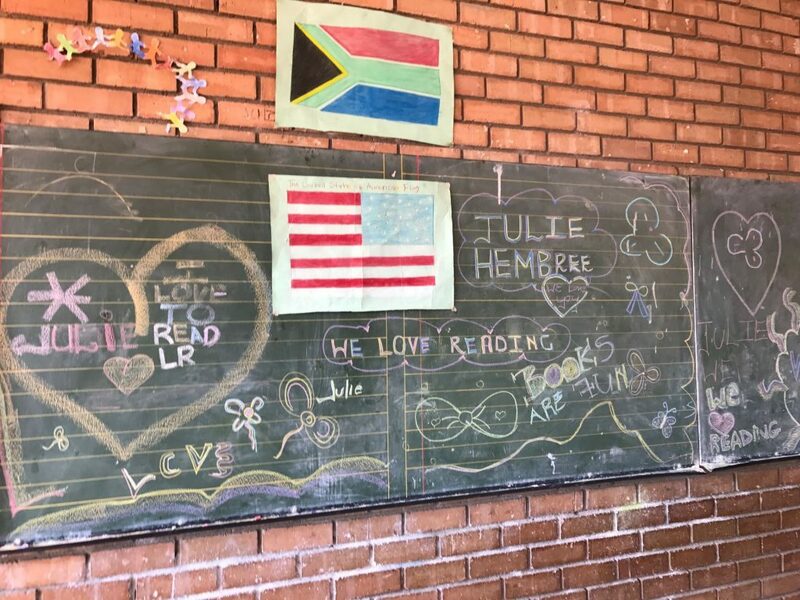 This post is the second in a series about my experience while teaching and traveling this summer in South Africa. The first post can be found here. It is also cross-posted on my Books to Africa blog. ​These ladies are part of my Microsoft Educator Network and shared their time and homes with me. I am so fortunate to be part of this organization where I can go across the world and meet up with friends. Fiona entertained me on my first night in Cape Town and made sure I wasn’t homesick. Our friendship dates back to 2011 when we met through blogging. I had started my Bulldog Reader Blog and was meeting different people around the blogging world. Fiona also had a blog, and a comment here and a response there, led to a friendship across the miles. ​We first met in person in 2011 when she came to Seattle with the Microsoft in Education program. We met again at an ISTE conference in San Diego. 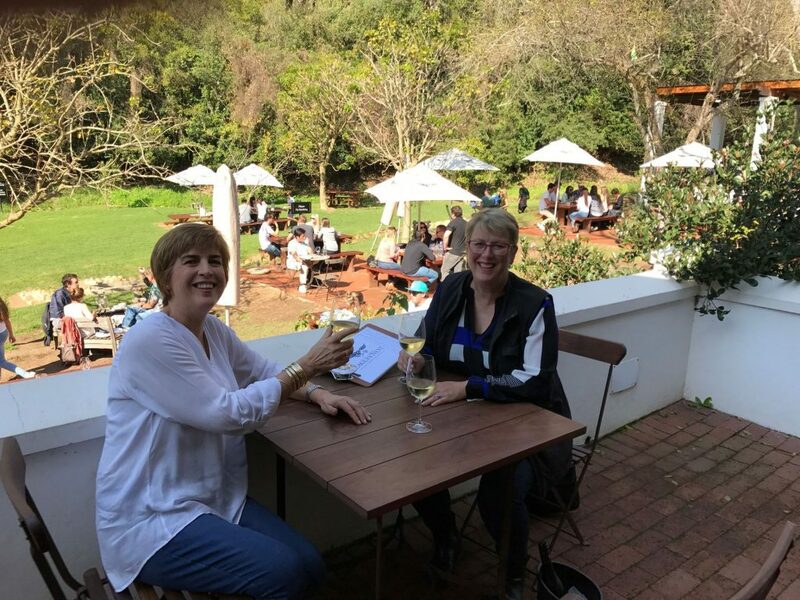 Now we were meeting on her turf in Cape Town! Our love for technology kept our conversation going for hours. 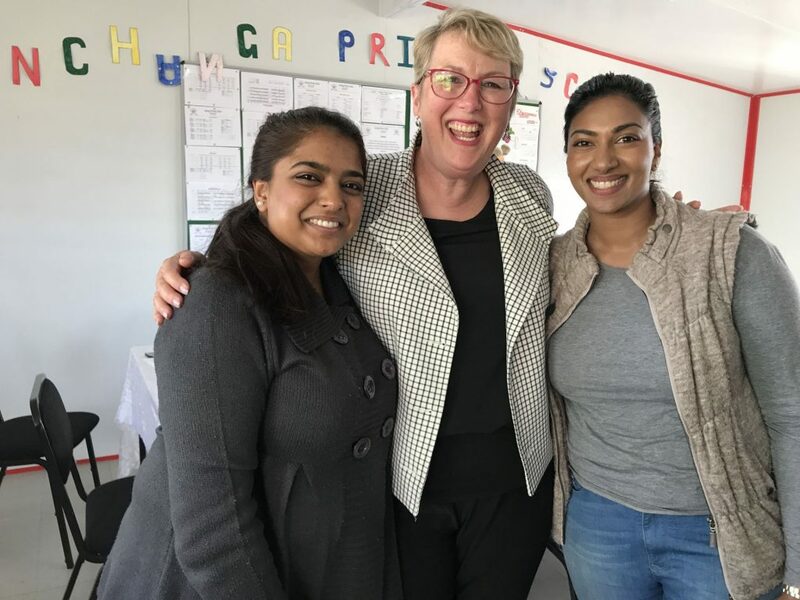 I loved hearing how Fiona’s desire to help others is taking her around the country leading technology training with teachers. Cheryl and I met in Budapest at the Microsoft Global Educator Conference. 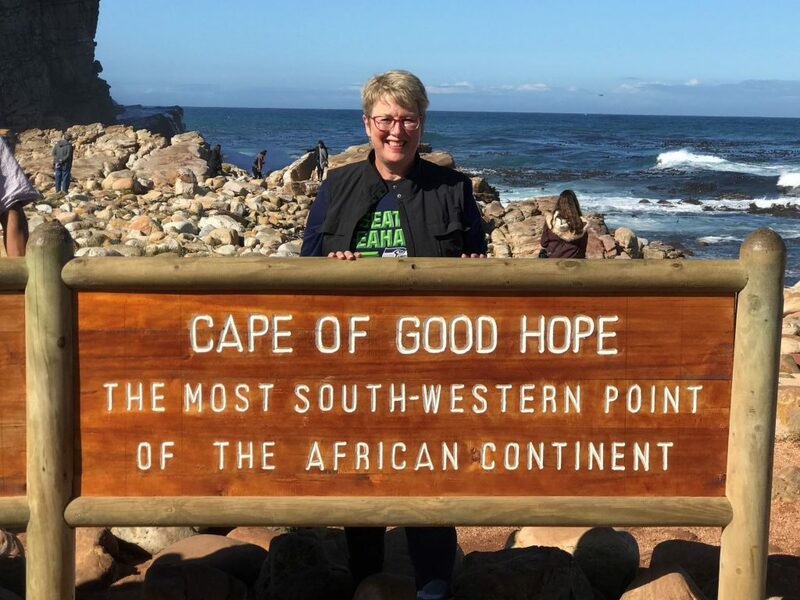 She teaches Biology at a private high school near Cape Town. 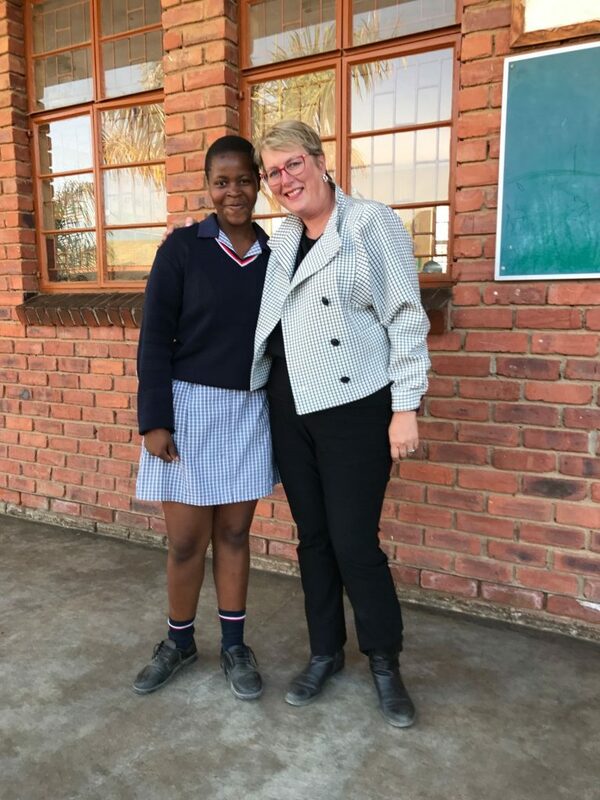 Cheryl took me around her school where I could see how they are integrating the Global Sustainable Development Goals at a school level. She inspired me to introduce the program at my school. I think it’s important to teach our students the impact they can have on their world. I think with the work that our school is doing with education already, learning about the goals is a natural fit. ​We also had great conversations about the work the students are doing at school regarding water conservation. In the Pacific Northwest with our abundance of rain ALL WINTER LONG, it’s a completely different mindset to think about how you preserve this resource. We have too much and they have not enough. The students have brainstormed and created posters to hang around the school reminding everyone about water conservation. 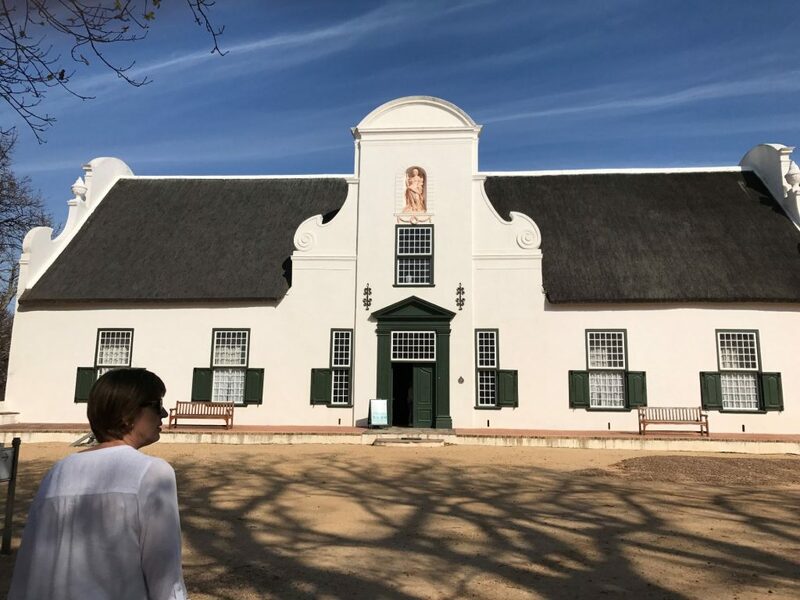 Cheryl and her husband also showed me around the Constantia wine farms which are known throughout the world. Even though it is winter and not much was in bloom, it was easy to imagine how beautiful the grounds must look in the summer. 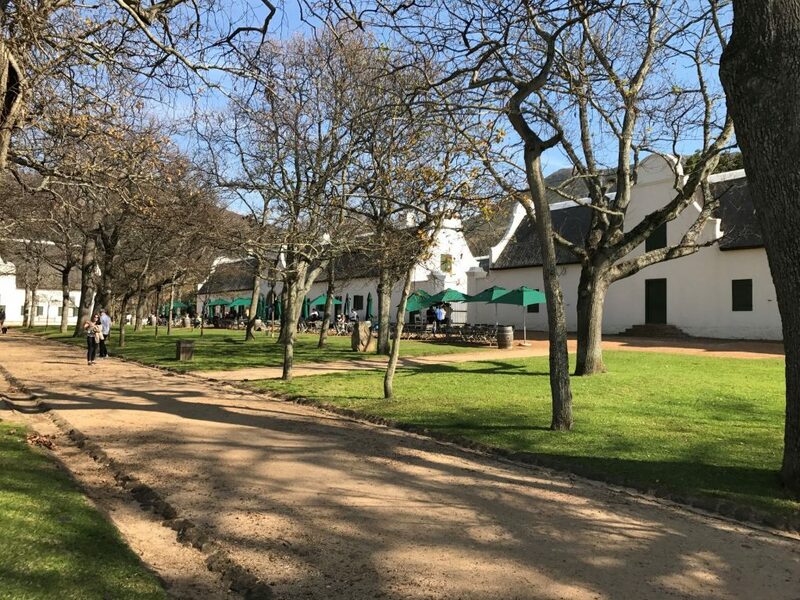 Seeing the Cape Dutch design buildings with the thatch roof is not something we see everyday here. 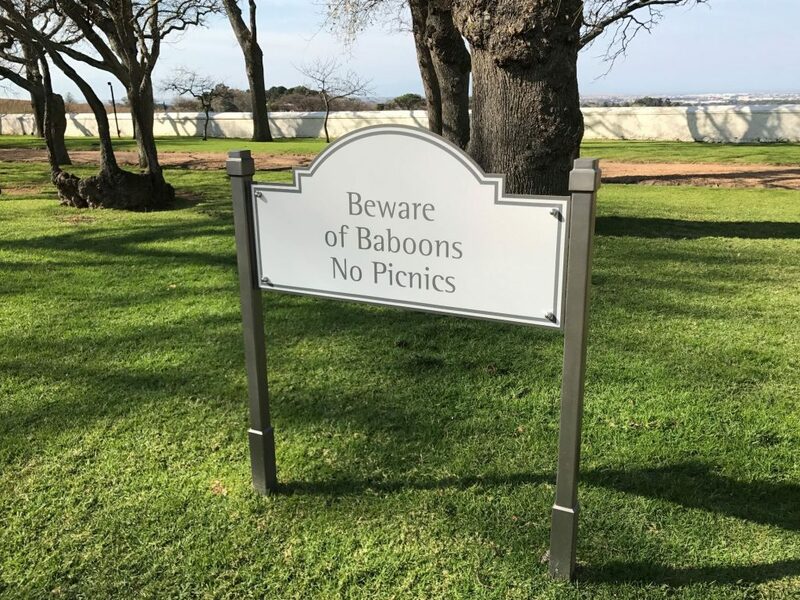 I was also very amused by the baboon sign. Not really something you see in Seattle! 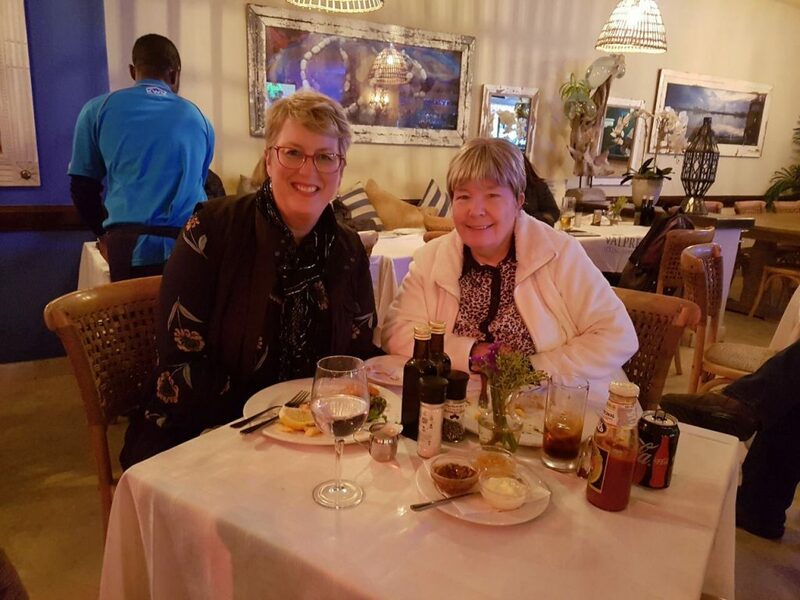 It truly was special to have two women in Cape Town with kindred spirits who were will to share their time and homes with me while I was there. 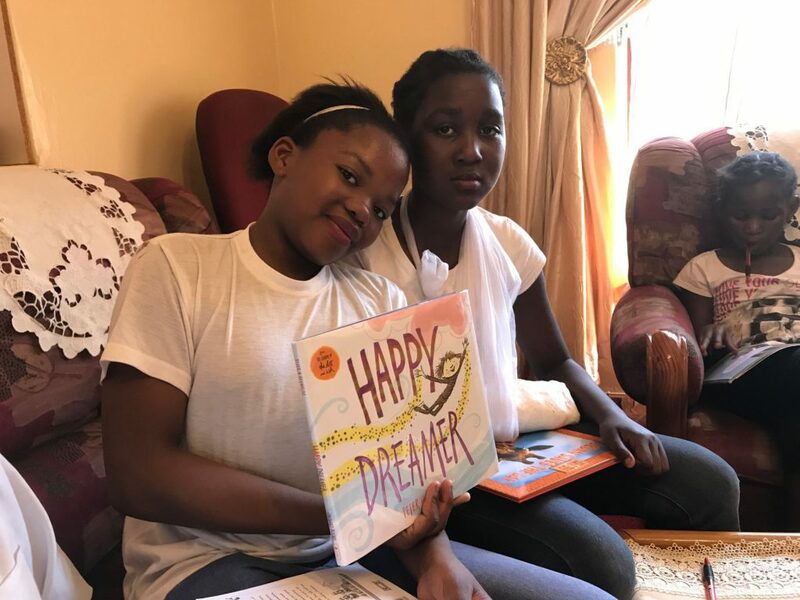 Click here if you would like to learn more about the Books to Africa Partnership. 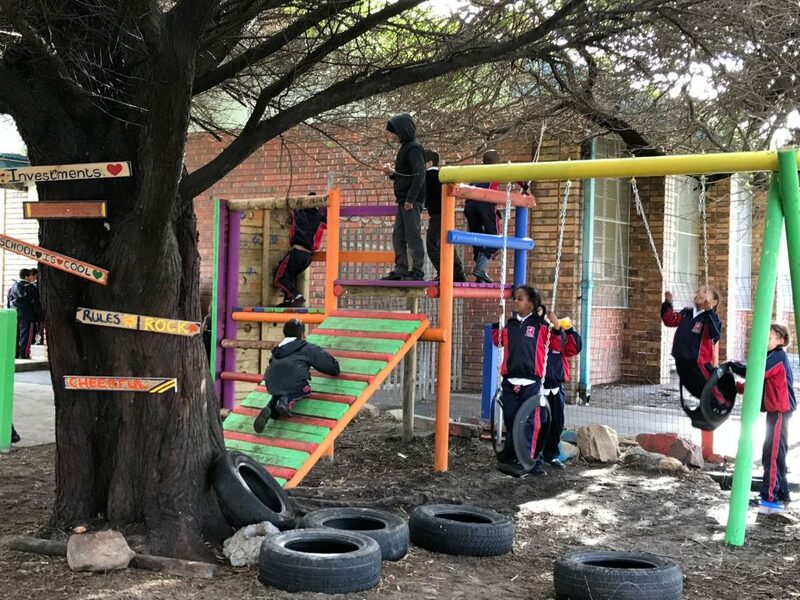 We are always looking for more people to help support our partner schools in Africa. However, today I started a new blog series about my thoughts about this trip. Words like amazing and heartfelt can describe my experience, but they don’t even begin to capture the depth of what I went through. Instead I decided to share through the lens of the people who made my trip meaningful. This post is also published here. 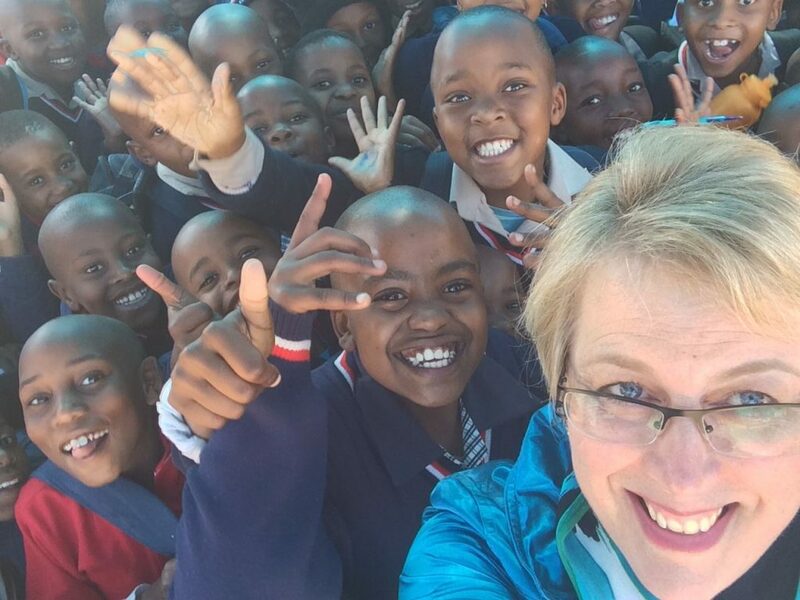 Words are usually my friend, but I’m finding it difficult to write down my thoughts about my trip to South Africa. 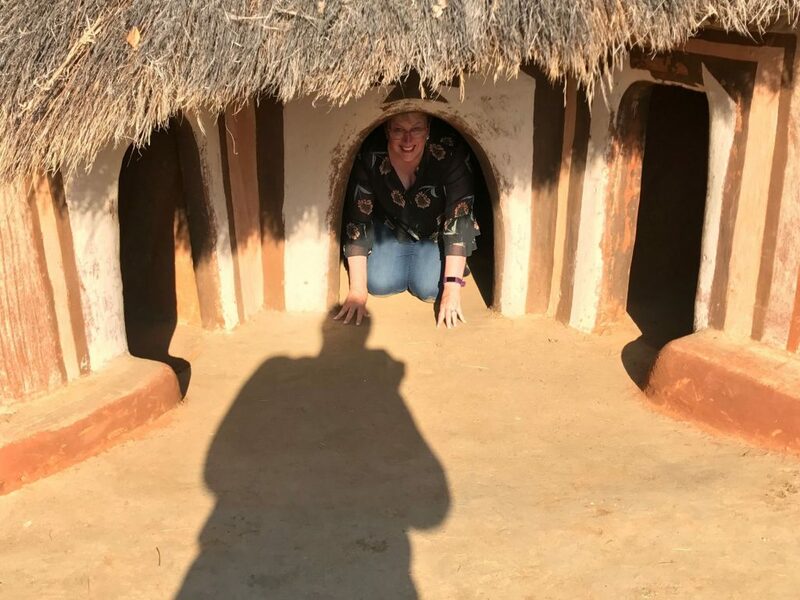 As I was thinking about how to write about this experience, I realized what made this trip so amazing was about the people I encountered along the way. 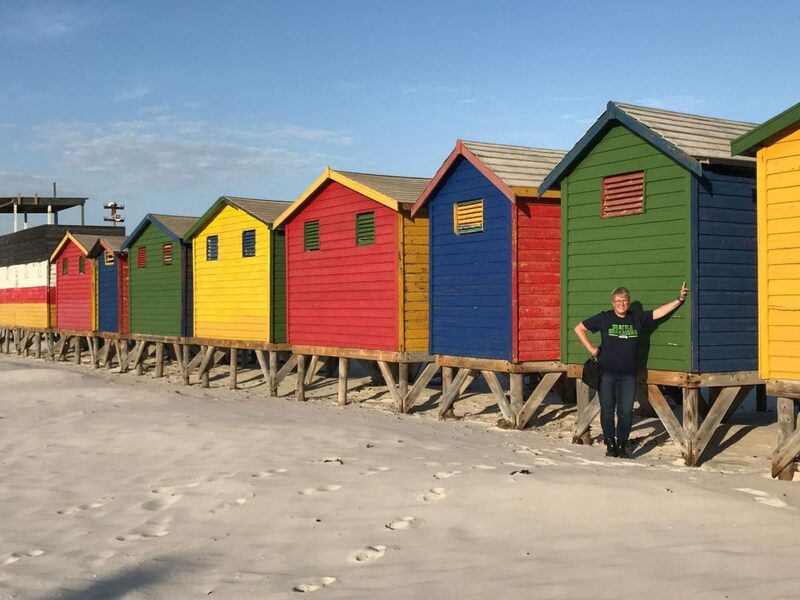 I have decided to share my trip through a series of blog posts about the people who made my trip memorable. ​The people I met all share a common trait. They care. This simple act of caring is having a longstanding impact on many people.. That may not sound so profound, but the reality is huge. By talking to parents, volunteers, teachers and students, I witnessed first hand the difficulties they face everyday. Huge class sizes, lack of resources, old computers, no internet, no paper or pens, and hunger are daily problems. Yet, in the schools and places I visited, I saw multitudes of people who care and by doing so are making a difference in the future of their country. 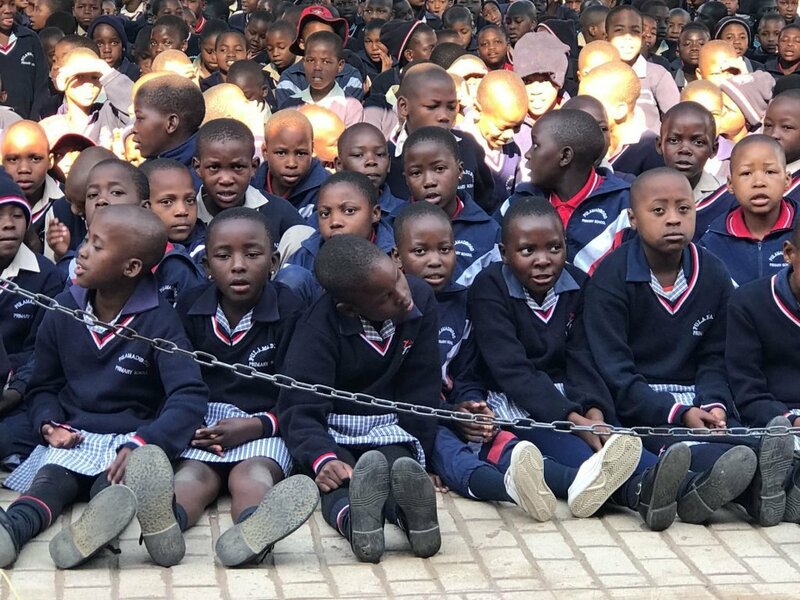 They are the future of South Africa. 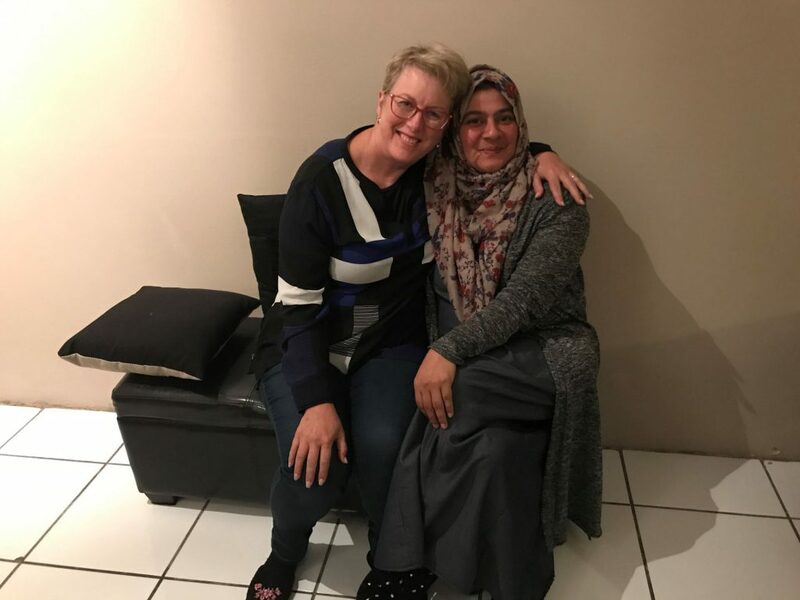 ​Faaidah and Mahavia opened their home to me and 13 other volunteers while I stayed in Cape Town. Their belief that it’s important to give back to others drives them to give people opportunities to help in their community. 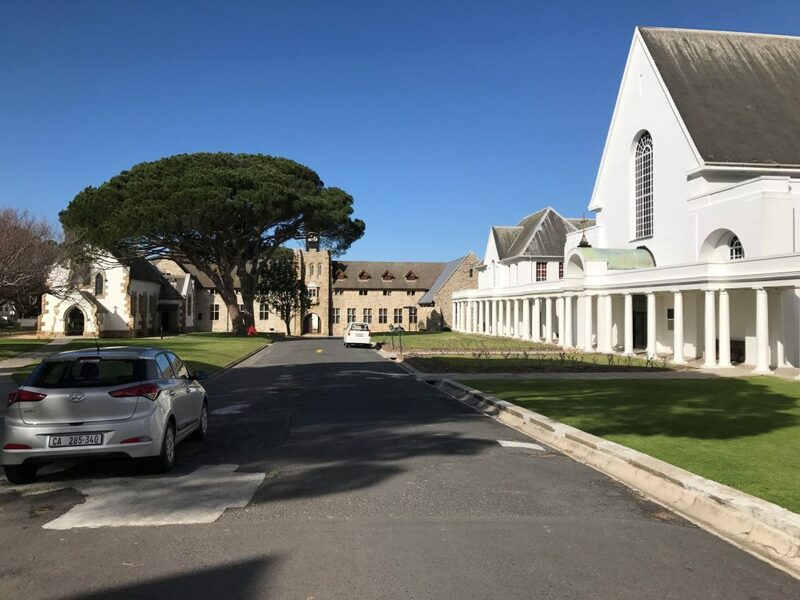 Our conversations filled in the gaps of knowledge I had about the history of Cape Town during the apartheid years where thousands of people were displaced from their homes and forcibly moved to new areas. 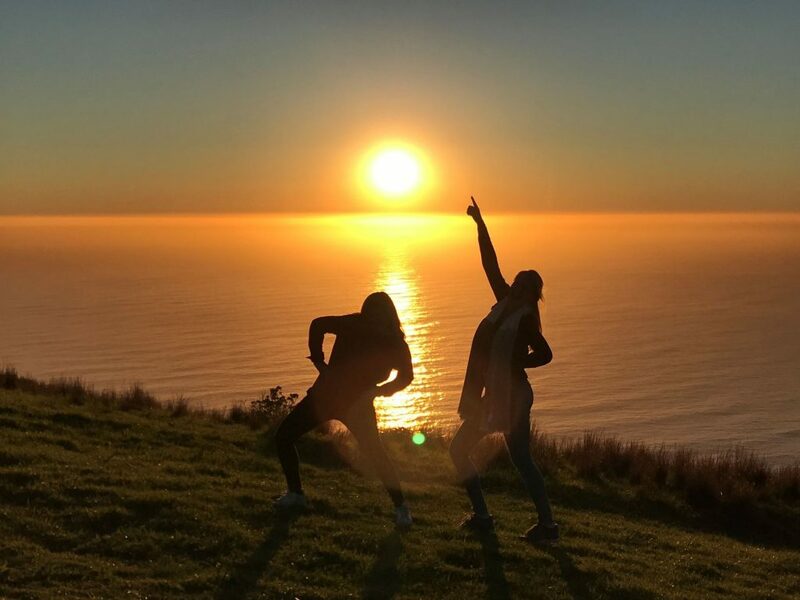 She made sure we experienced the joys of a sunset on top of Signal Hill and see the colorful huts at Murzenburg Beach. 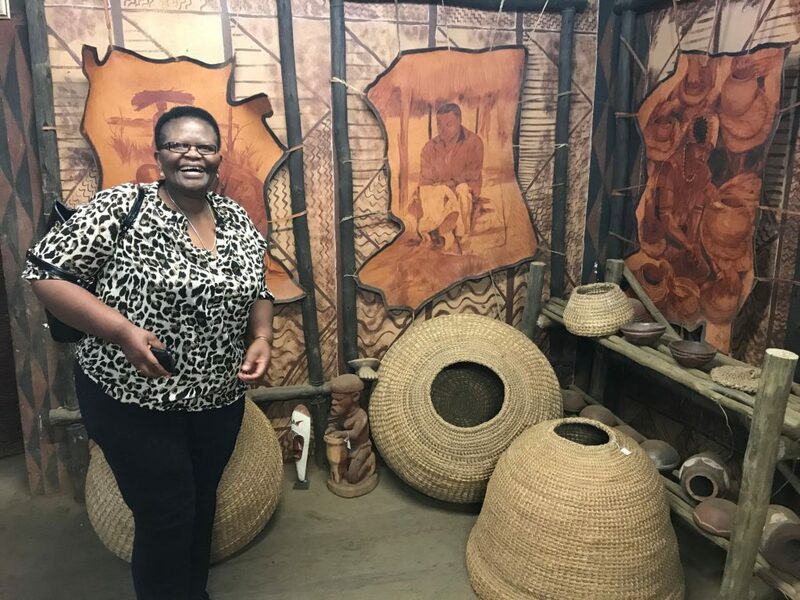 She urged us to visit Robben Island to understand about the history of Nelson Mandela’s life. 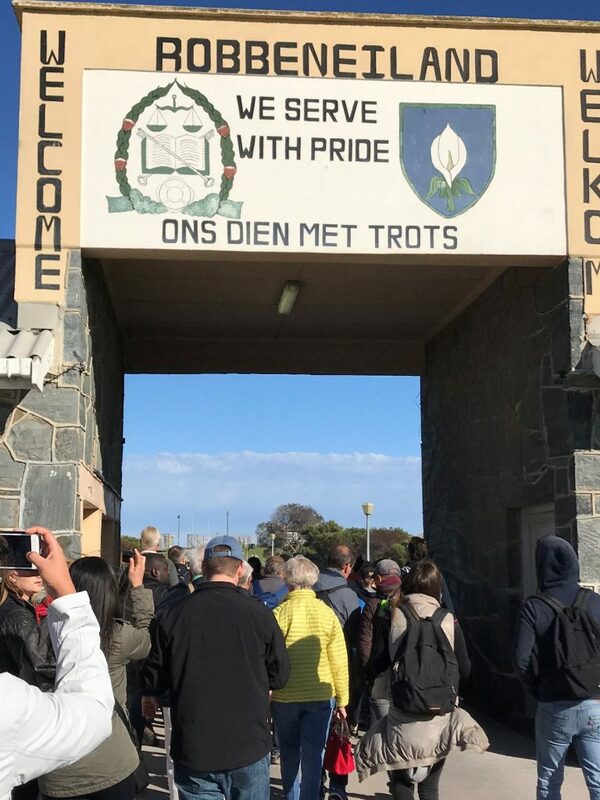 We learned about the politics of the Cape Town region and the complexities of racism that still exist in both of our countries. They took another volunteer and I to one of the squatter camps where we passed out pens, books and other materials to children living there. Children pushed and shoved to make sure they could get something and were disappointed when we ran out of supplies. I spent the rest of the day contemplating the reality of this living situation and wondering how it could change. Obviously if there was an easy solution to get families out of squalid living conditions, it would have already been accomplished. I was saddened by the reality of the fact that there are no easy solutions. 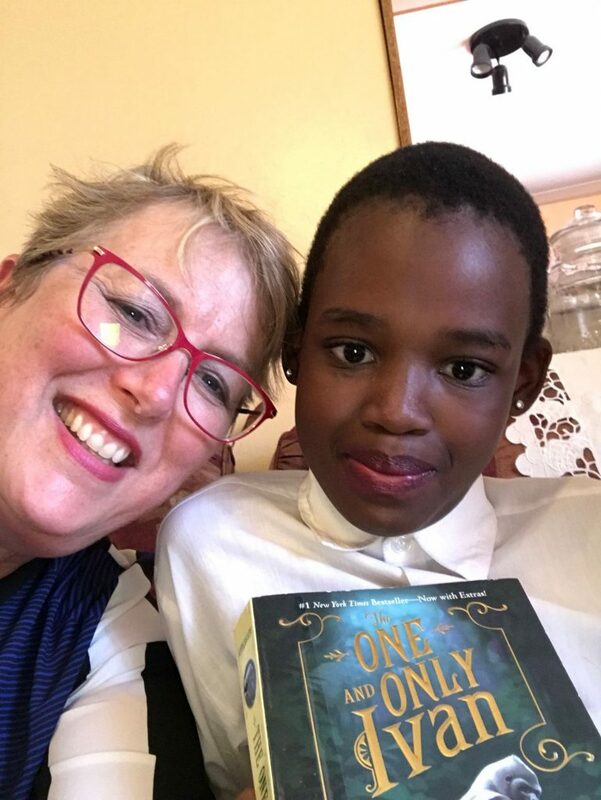 Seeing how down I felt about the experience, Faaidah shared that she heard one boy walk away with a book and a pen saying, “This is enough for me.” At that moment in time, I hope it was enough, but I also hope the future will bring him more. We also talked about religion. While I have met many Muslim people, I had never had the opportunity to really talk in depth to a Muslim about their faith. Faaidah opened her heart and faith with all of us, renewing my belief that it’s not a person’s faith that defines them necessarily. What matters is within the person’s heart and soul. I left Faaidah’s home knowing that while we might be different on the outside, our commonalities on the inside matter more. Her family’s desire to make sure volunteers have a safe place to live while they work in the area speaks volumes about their desire to care. I truly was fortunate to have to opportunity to live with Faaidah and Mahavia while I was in Cape Town. The sun rays are warming away the winter blues as you sit on the beach. You have your beach chair, the one where you can sit low and let your toes massage the sand underneath them. The kids are happily making sand castles and you are settled in to get some great beach reading done. Your favorite beverage is close by so you won’t be distracted by mundane refills tasks as you lose yourself into the pages of the book you so carefully chose for this trip. The book came with a 4 or 5 star rating, so you know it’s going to be great. Then it happens. A chapter in, your attention suddenly drawn to the intense beach volleyball game happening nearby. You listen for the sounds of your children and realize they are just fine. You go back the book. Five minutes pass. Now the sand that seemed so soft is beginning to scratch the bottoms of your feet. The kids squeals of laughter nearby seem a little more harsh and loud. So, you decide to move your chair just a few inches to the left. Settled again, you open up the book and realize you aren’t really sure where you left off. Annoyed, you close the book toss it into the sand and go off to join the kids making the sand castle. What just happened? I call this scenario book abandonment stage 1. Generally when readers have the right book, the screams from the kids making sand castles wouldn’t faze them even in the slightest. We readers call that “nose-in-a-book-syndrome”. Wild horses running by might get a glimpse as you turn the page, but little more. Join the volleyball game? uh…no! Are you kidding? You need to see what’s going to happen in the next chapter. There’s. No. Time. To. Stop. Reading! It’s called Abandon That Book, except when you suffer from the syndrome – I Can’t Abandon A Book, It’s Against the Rules! Blame the keep reading it message on your parents, teachers, librarians, friends, etc. Who knows when you got the message, because it’s very prevalent. I know I lived by it until I was in my 30’s. What? Don’t finish a book I had started? I thought the Book Gods would descend on me and pummel me senseless with old Encyclopedia Britannica volumes until I screamed for forgiveness. Yet, there was a book one time that I couldn’t stomach one more page. I closed it. Pulled out the bookmark. put it facedown and never touched it again (except to hand back to a teacher). (PS- I bought the Cliff Notes and read as much as I could about the book without really reading it. 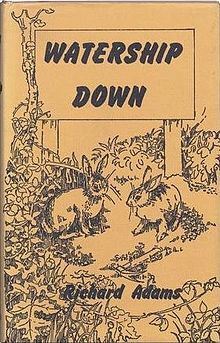 Yes, I suppose this is called book cheating) That book was Watership Down by Richard Adams and was very popular when I was in high school. In fact, it was pretty forward thinking of my English teacher at the time to assign this book instead of one of the classics. In fact it won a bunch of awards and inspired the 1978 movie and later a television series of the same name. I know there might be gasps from people who are reading this post and saying, “I loved that book! How could she?” However, that one experience was so unpleasant , it ruined my interest to read any other fantasy genre books. The book has a talking animal, rock, spaceship (insert noun here)?? Forget about it! I’m NOT going there. That experience started me on my path of abandoning books without needing therapy for the decision. It did take me another 15+ years to do it, but I’ve not looked back since. It’s OKAY to put down a book you don’t like! I would even go so far to say to a student who is reading as assigned book that they despise, to talk to the teacher and find another with a theme that is comparable. Suffering while reading should never go hand in hand. There are too many fabulous, wonderful, you will melt when you read them books in the world. How do you know when to give up? There are some signs it’s tie to ditch the book and really get rid of it. Don’t put it on your bookshelf and then feel guilty every time you see the spine sticking out. Donate that book and get it OUT of your house! When you are reading a new book and you find yourself distracted by everything around you. When you start thinking about loading the dishwasher or wondering when the last time was that you scrubbed the downstairs toilet, there’s a PROBLEM brewing. If you are a chapter or two into a book, or you find yourself ten pages ahead, but absolutely don’t remember what you’ve read, then it’s time. I give myself about 2-3 chapters (50-100) pages before I say enough. There are too many fabulous books in the world to have to labor through one. When I talk to adult friends about their reading habits, more often than not, the ones who aren’t voracious readers, tell stories of how reading what hard when they were young. The word hard has different meanings for different people. Sometimes hard was a decoding issue. The concept of reading and decoding words was hard because of different issues such as dyslexia or sight problems. In other cases the word hard referred to the content. It was hard to get into the book because it wasn’t interesting. Asking some readers to read fiction is equivalent to torture. Others prefer non-fiction or forget it. Know yourself as a reader. If you have tried a genre and it didn’t speak to you, don’t give up on reading. That’s like saying you are going to never drive again, because you learned on a “3 on the tree” old farm pick up truck. There is a world of books out there waiting for you to enjoy. Things have improved! And don’t forget the audio books. Remember those days when your parent read to you? Listening to a narrated book is the next best thing! Going on a long car trip? Check out a book CD and drive in listening pleasure! Have a great reading summer! Have you ever abandoned a book? Leave a comment and tell us why!